I had just returned from almost a week in Bavaria, and I was going back on White Saturday to Nuremberg for a day trip with arsviva, the Czech travel agency I sometimes used. I had traveled with them to Bamberg, where I had been enchanted with the fishermen’s houses of Bamberg’s Little Venice, the gushingly Baroque Böttingerhaus, the Early Gothic nave of the Imperial Cathedral with its Christmas Altar and the majestic New Residence Palace with its ornate Imperial Hall. 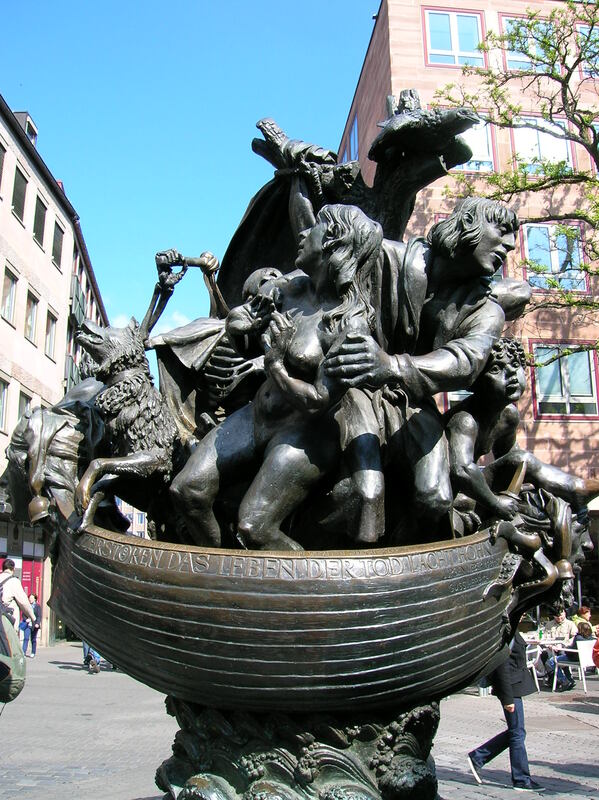 The same guide that had put us under Bamberg’s magical spell was leading us through Nuremberg, which now was biggest city in the Franconia region, with a population of 500,000. On the bus the guide gave us some background about the city. 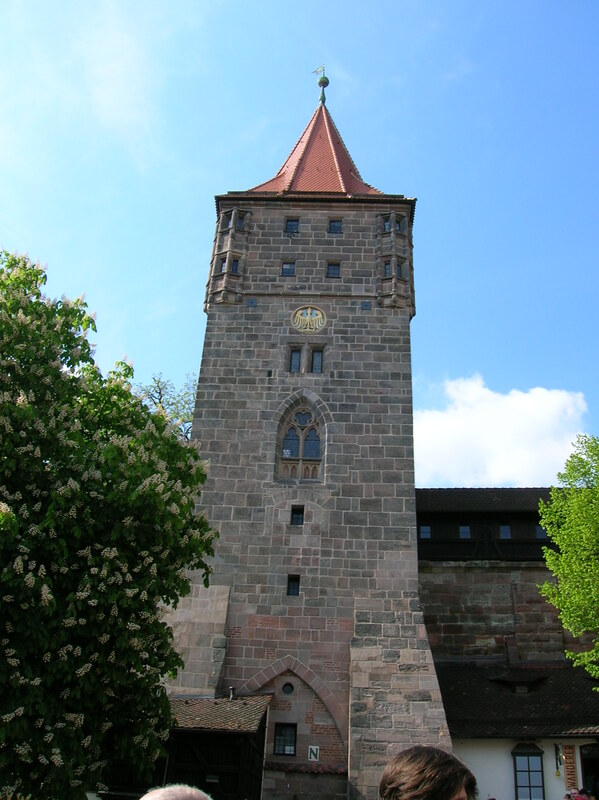 Nuremberg started out as a fortress in the 11th century. 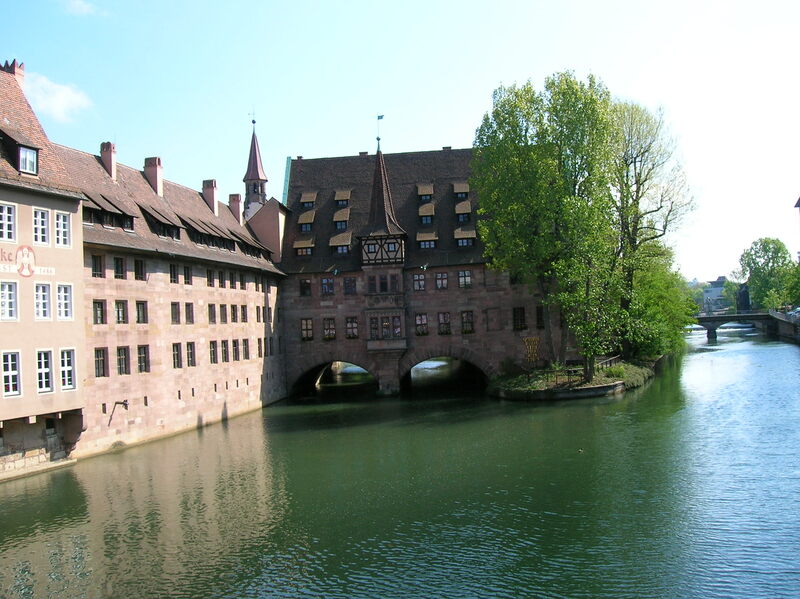 While medieval Nuremberg was an important town along the trade route to the east, it was not without its problems. A pogrom in 1349 wiped out almost half of the Jewish population in the town. 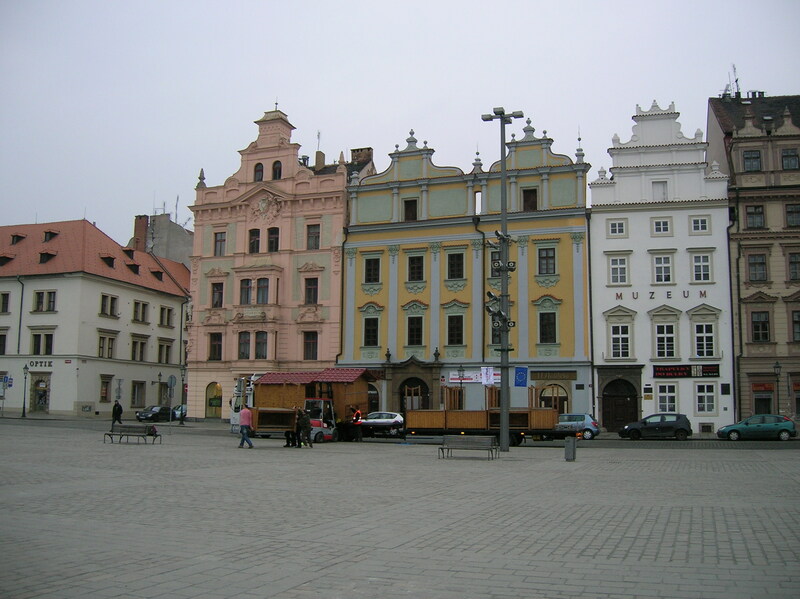 The pogrom took place after it was decided to demolish the Jewish quarter in order to make room for a central square. 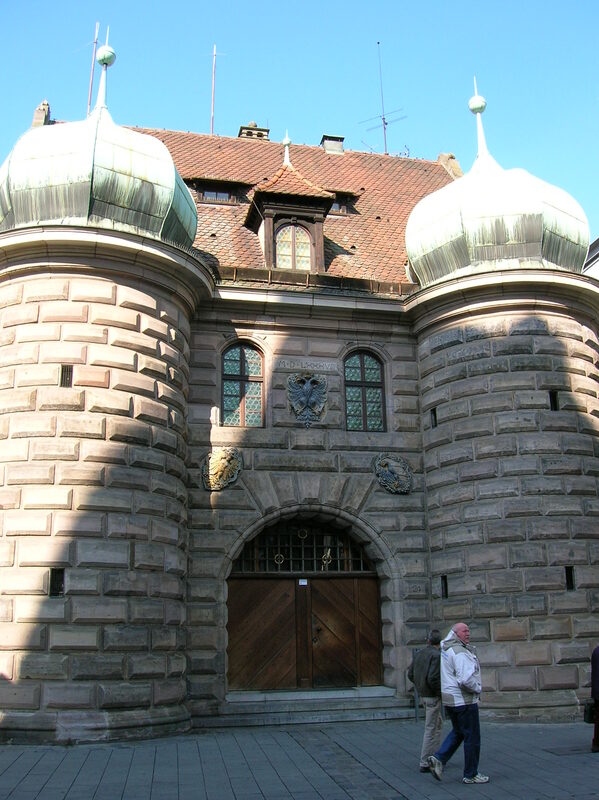 The year 1356 brought prestige to Nuremberg, which became an imperial city thanks to Holy Roman Emperor Charles IV’s declaration of the “Golden Bull.” The emperor also declared that the first imperial diet when the seven electors were choosing a new German king would take place in Nuremberg. 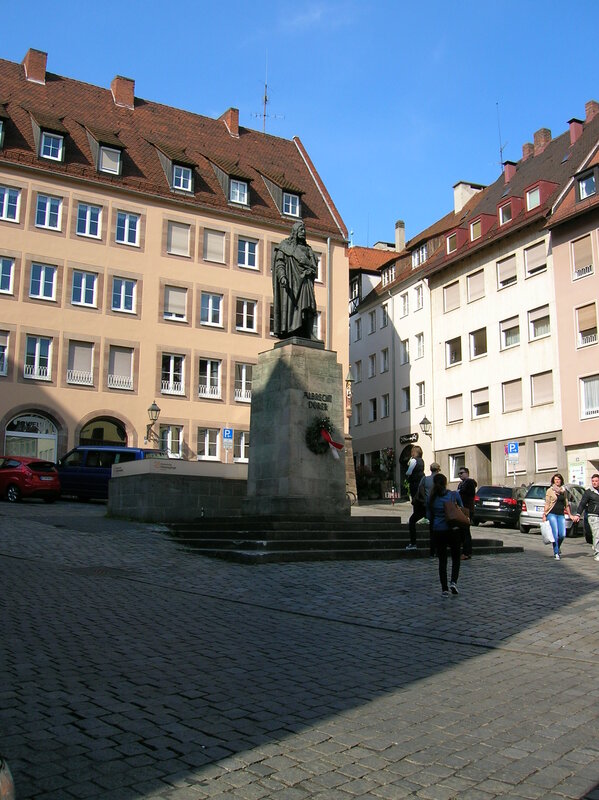 Emperor Charles IV also visited Nuremberg more than 50 times. The imperial crown jewels were stored at the castle in Nuremberg from 1424 to 1796. 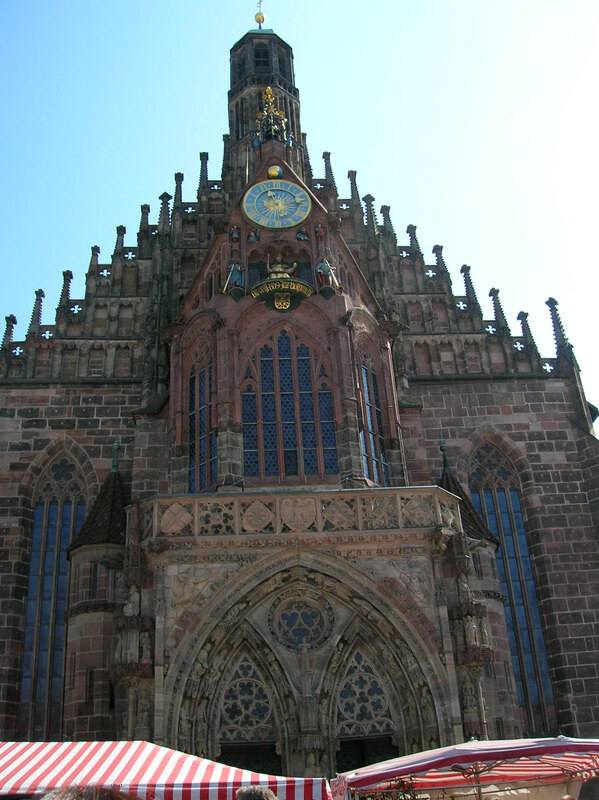 Nuremberg favored Protestantism from the 16th century. The seven electors held the imperial diet there until 1542. 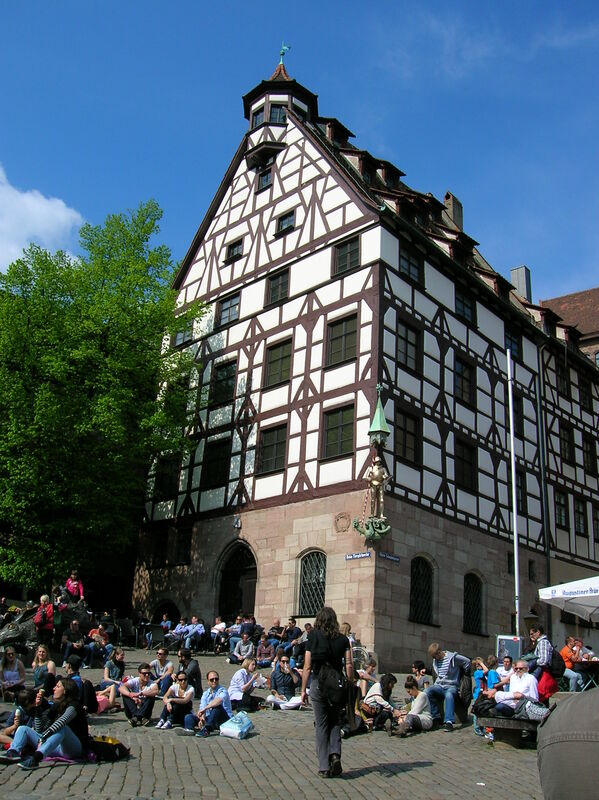 Many inventors and artists lived in Nuremberg. Albrecht Dürer worked there in the early 16th century. 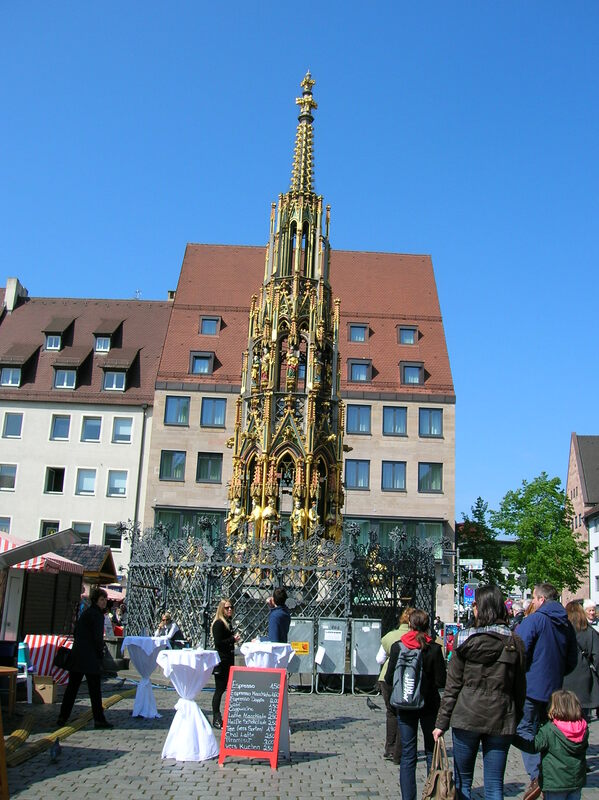 Sculptors Adam Kraft, Veit Stoss and Peter Vischer decorated the town with their magnificent medieval creations. 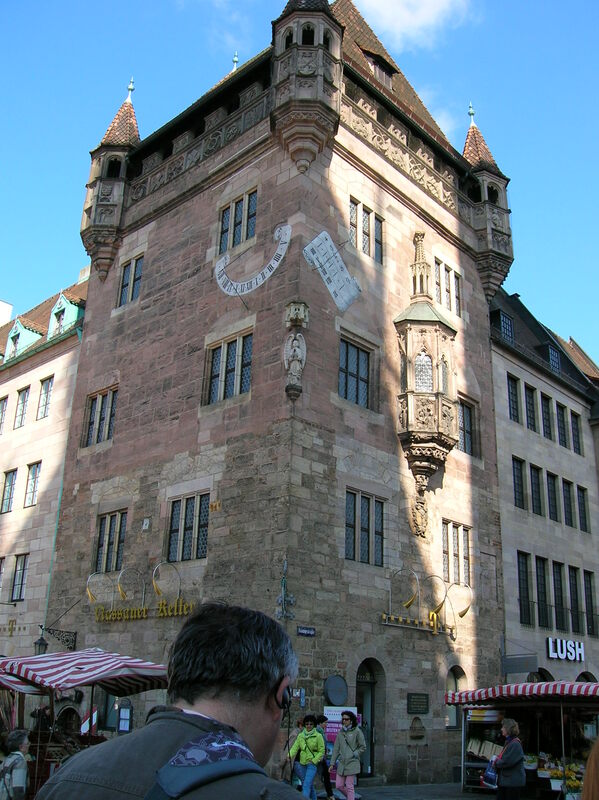 Martin Behaim invented the first globe, and Peter Heinlein made the first pocket watch in Nuremberg. The Thirty Years’ War brought devastation to the town, even though Nuremberg remained neutral. Then the town experienced financial problems and soon found itself broke. 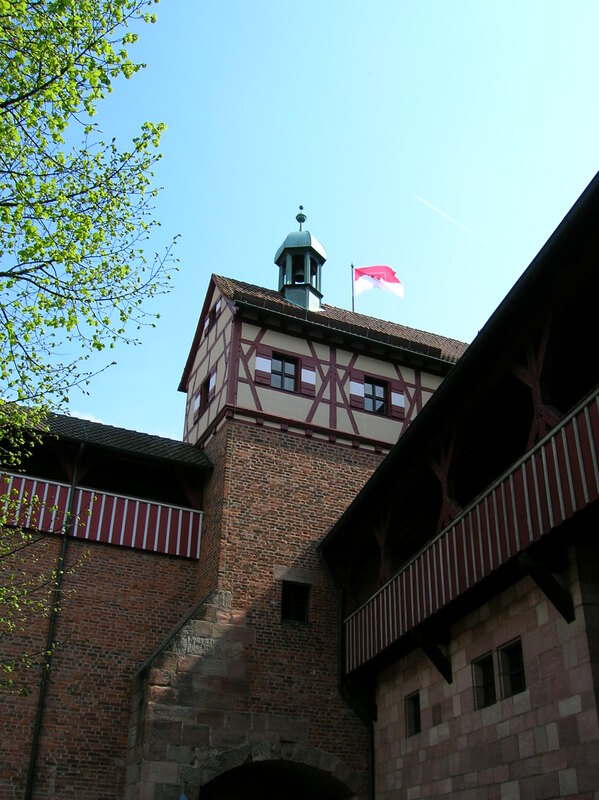 Nuremberg was made part of the Bavarian kingdom in 1806. 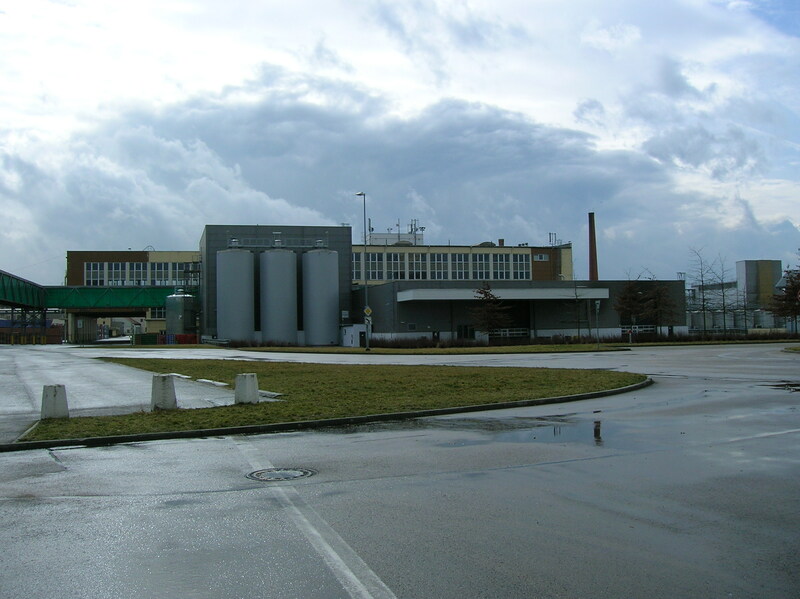 During the 19th century, the town focused on industrialization. Nuremberg would become the site of the National Socialist Party’s rallies in 1927. The Nuremberg Laws, enacted in 1935, denied Jews basic rights and German citizenship. Adolf Hitler was very fond of the city. The Allied Forces’ air attacks in January of 1945 destroyed 90 percent of the historical center and more than 2,000 people lost their lives. 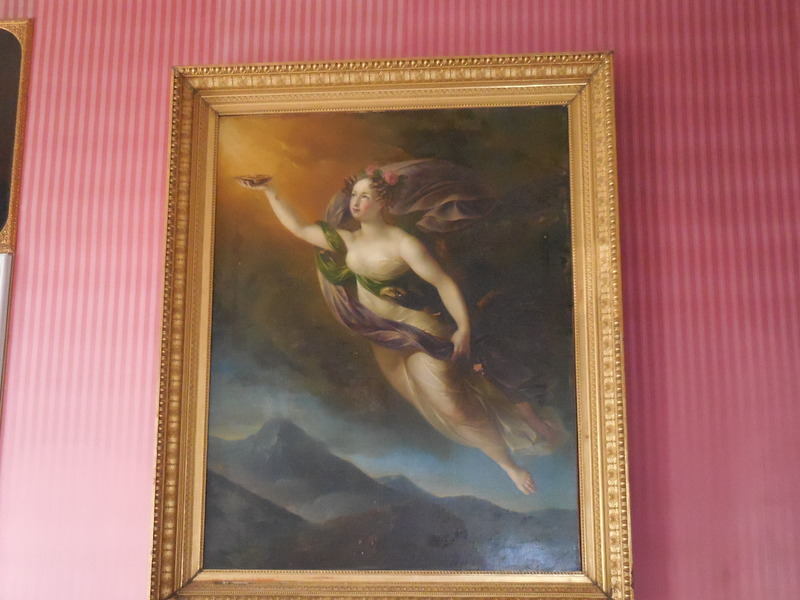 Many of the artworks had been moved to the Art Bunker under the castle, and thus were saved. The Nuremberg Trials that put the leaders of the Third Reich on the stand took place from 1945 to 1946. First, we stopped at the gray, massive grandstand, where the Nazi Party Rallies had been held from 1933 to 1938. Bigger than Rome’s Coliseum, it included 60 hectares and had 28 40-meter high towers. We saw the exterior because on a day trip we did not have time to go inside the Documentation Center of the National Socialist Party Rally Grounds, where there is an exhibition about the Third Reich. Albert Speer’s architecture was so dehumanizing. Gray, drab and disintegrating, it lacked any human feeling, any feeling of life. Speer’s buildings did not even last 50 years, and they were meant to last forever. 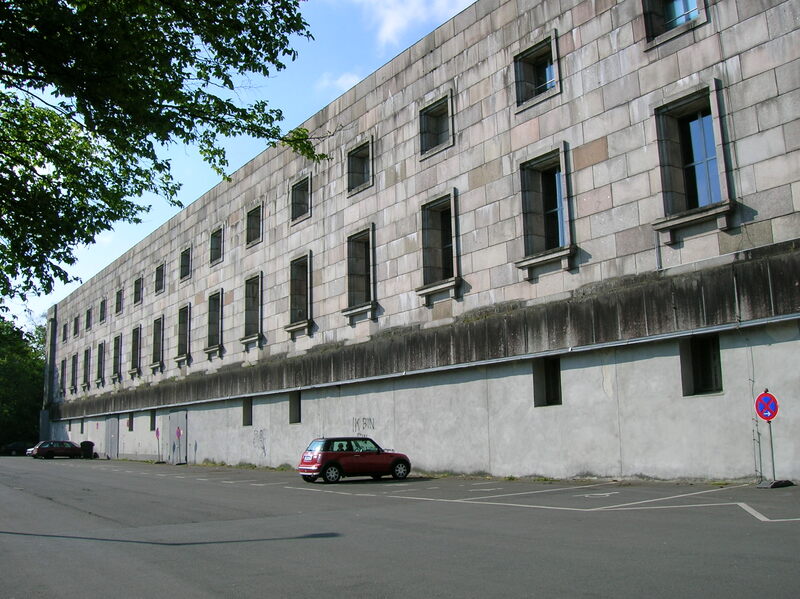 I would have loved to have visited courtroom 600 in the Palace of Justice, where the Nuremberg Trials had taken place. 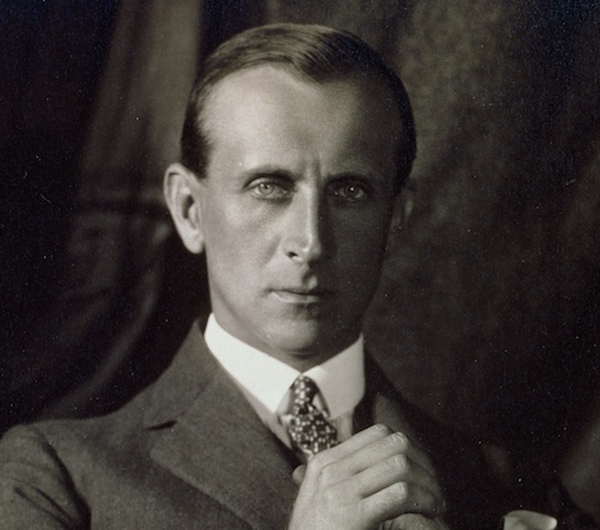 I wondered what it would have felt like to have been in that courtroom during the trials, to have watched death sentences being handed out to Wilhelm Frick, Hans Frank, William Keitel and others. Even the death penalty was not a harsh enough sentence for what these Nazis had done. Then we got back on the bus, and soon we were left off at the German National Museum, which was on the itinerary much later in the day. As we walked from the German National Museum to St. Lawrence’s Church, we passed Mauthalle or the former imperial customs office dating from 1500. Opposite it was the façade of the Renaissance former imperial arsenal, adorned with coats-of-arms and dating from the 16th century. I took notice of its two round dome towers. The guide pointed out a magnificent oriel on one building. There were about 80 oriels in the city. On the way to the church, we passed by many stalls in the Easter Market that made the town lively, even jubilant. The sun was shining, and it would have been impossible not to feel cheerful in this environment. Stalls offered vegetables, flowers, postcards, soft pretzels and much more. I was especially drawn to the huge soft pretzels, which I had devoured during my stay in Munich the previous week. Soon we came to St. Lawrence’s Church. During the 13th century, a Romanesque basilica had stood on this site. The rose window between the two 82-meter towers fascinated me. The tracery of the window was remarkable. A wreath surrounded the window. Certainly one of the most beautiful Gothic facades I had ever seen, the façade dated from the mid-14th century. The buttresses and spires that looked like pinnacles made a strong impression on me, too. A decorative gable was situated above the rose window. The main entrance boasted such elaborate sculptural decoration and reliefs. 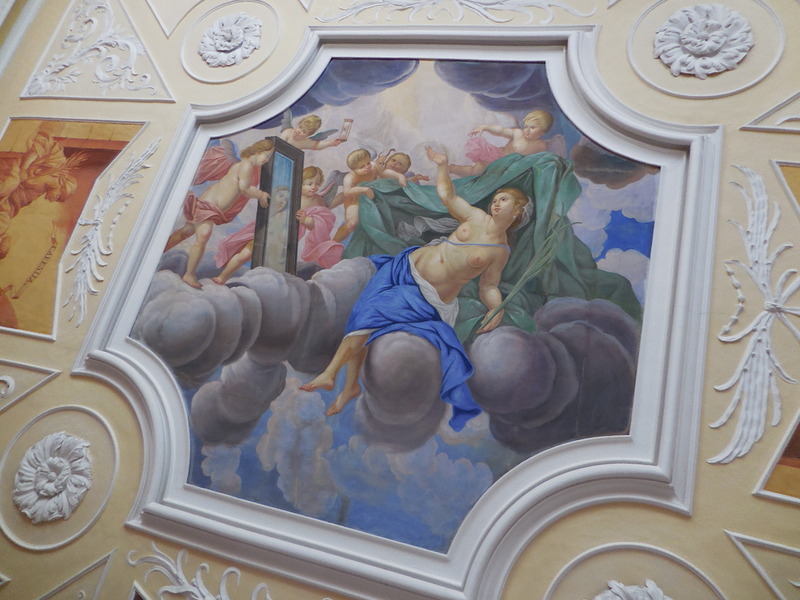 The sacristy, two stories high, had a stunning relief on the façade. 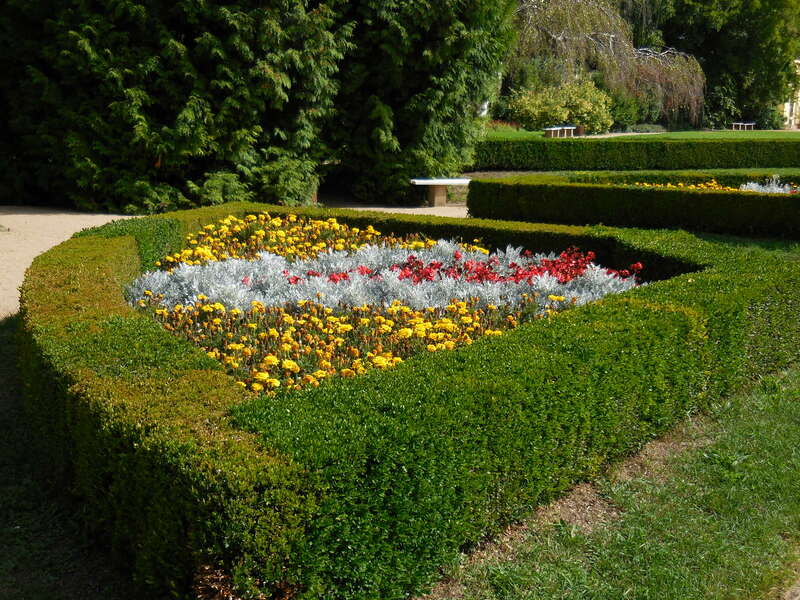 I noticed a sundial, too. One sculpture from 1912 showed a monkey reading The Bible. When we went inside, I was so overwhelmed by the spaciousness and weightlessness that I just stopped in the choir, ignoring the group for some minutes, and just stared. 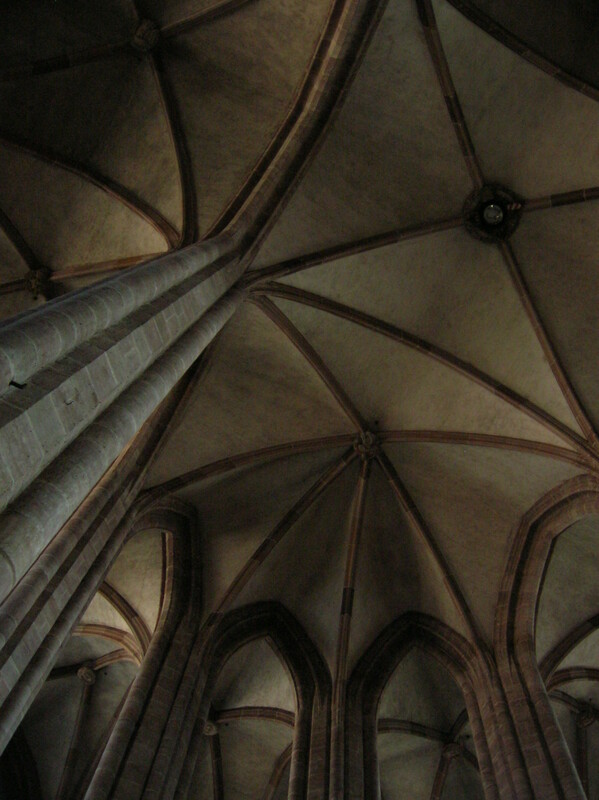 The Late Gothic choir and the Gothic vaulting amazed me and made me dizzy with awe. Everything seemed so harmonious. What dazzled me was the choir carving of the Annunciation, with larger-than-life size statues suspended from the vaulted ceiling. 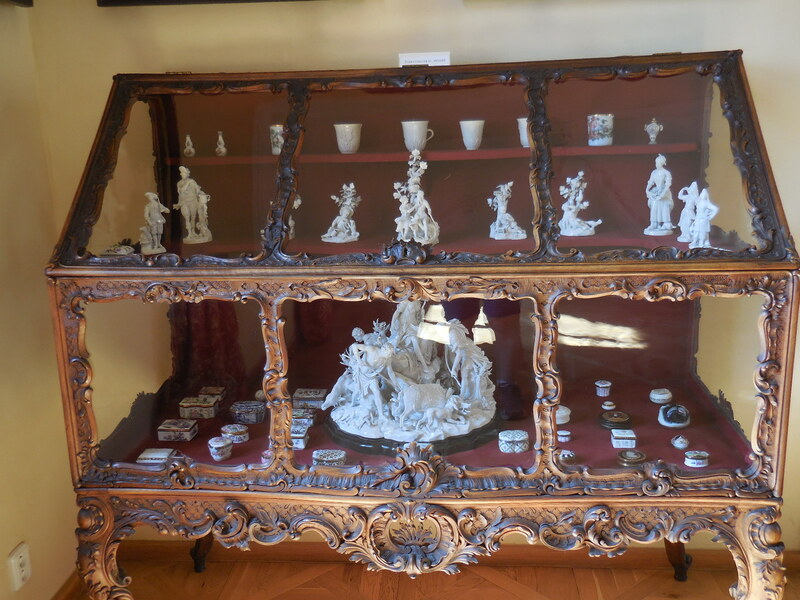 It was the work of master sculptor Veit Stoss. I noticed Gabriel and the Virgin Mary, a dove fluttering over her head. Four angels seemed to float over this grouping. Fifty roses decorated the wreath framing the scene. The rosary beads included 63 pearls. Reliefs also adorned the ornate wreath. The flowing golden drapery of the figures also caught my attention. To see the carving suspended gave me an even greater feeling of weightlessness. It was as if the sculptural grouping was ascending to Heaven, rather than rooted on the ground, on Earth. 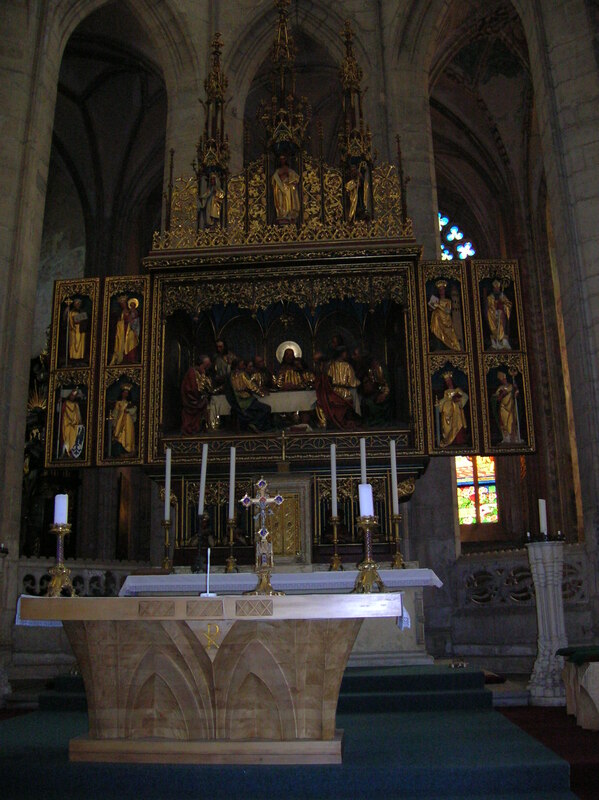 The High Altar was stunning with a crucifix from the 16th century. The tabernacle, more than 20 meters high, entranced me. Pinnacles represented a crown of thorns. The reliefs were remarkable. I was awed by the latticework and tracery. 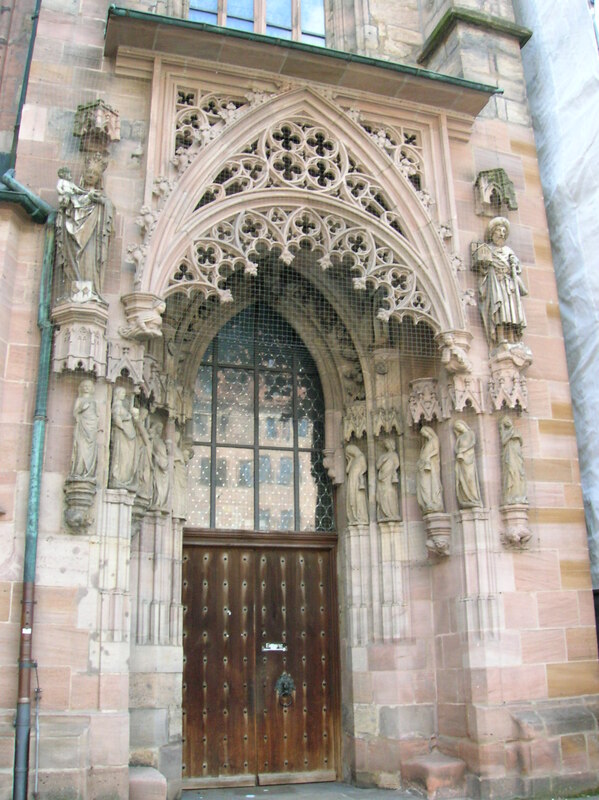 One of Nuremberg’s oldest sculptures, the Beautiful Madonna, showed the Virgin Mary and Baby Jesus with bright smiles as the Virgin Mary looked lovingly at Jesus. 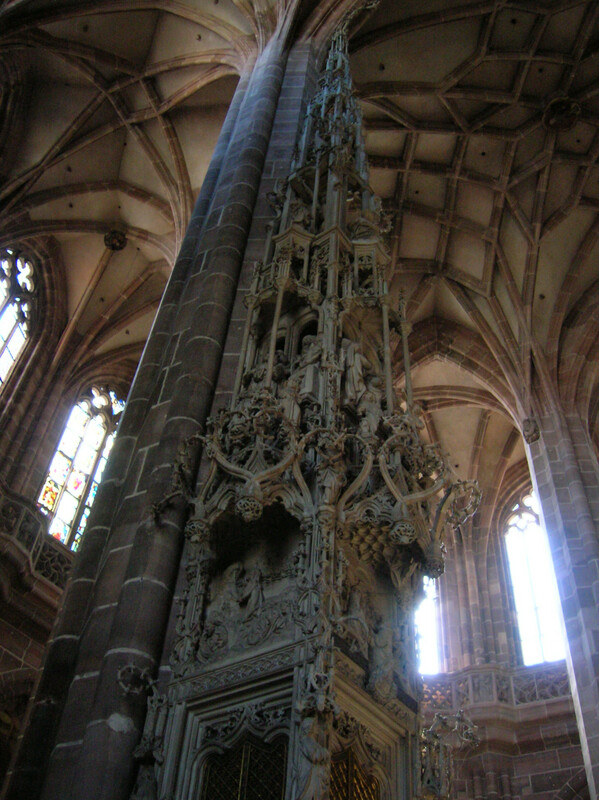 The pulpit was Neo-Gothic. The Late Gothic brass chandelier in the nave was authored by Peter Vischer in 1489. Life-size Apostles also made appearances. It is possible that Stoss created the stunning sculpture of Archangel Michael wielding a sword in his right hand. I was especially drawn to the folds in the figure’s drapery and to the curls in his hair. 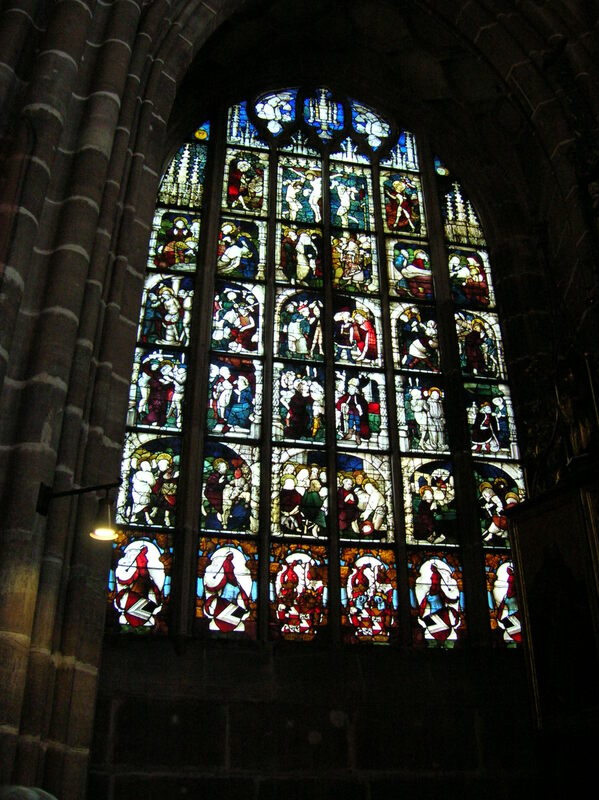 Stained glass windows hailed from medieval days, reminding me of the cathedral in Regensburg with its brightly colored windows that brought light and knowledge. The stained glass of the rose window boasted decorative designs. The background of the Krell Altar showed the oldest rendition of Nuremberg, dating from 1472 to 1483. The town looked so realistic and detailed for that time period. 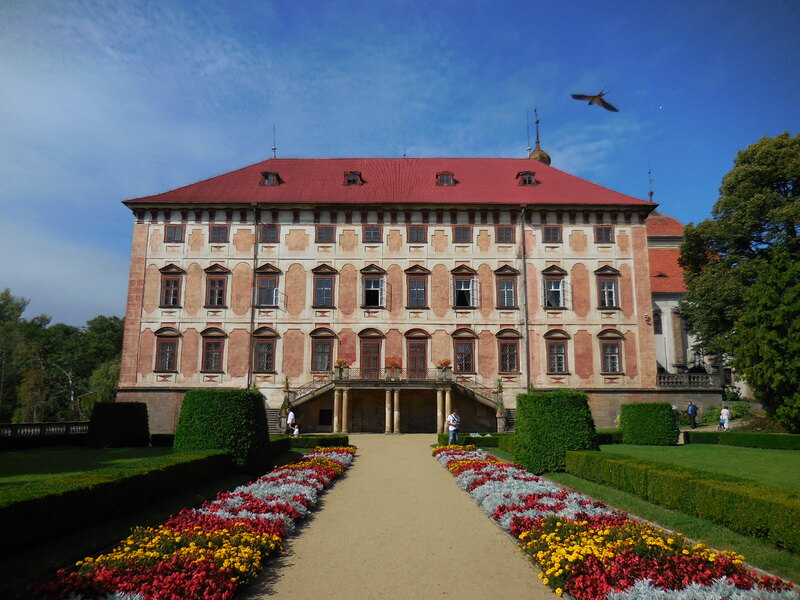 I recalled the 17th century maps and vedutas at Mělník Castle near Prague, and how realistic and detailed they had looked. During World War II the sculptures and other artworks were hidden in the Art Bunker rock cellar under the Imperial Castle. Although the building was damaged in the Allied Forces’ attacks, the two towers, the western façade and the walls remained standing. Next we visited St. Sebald’s Church, which was founded in 1230. The stained glass windows left me in awe. I saw another relief by Kraft, this one depicting the legend of the Holy Cross. 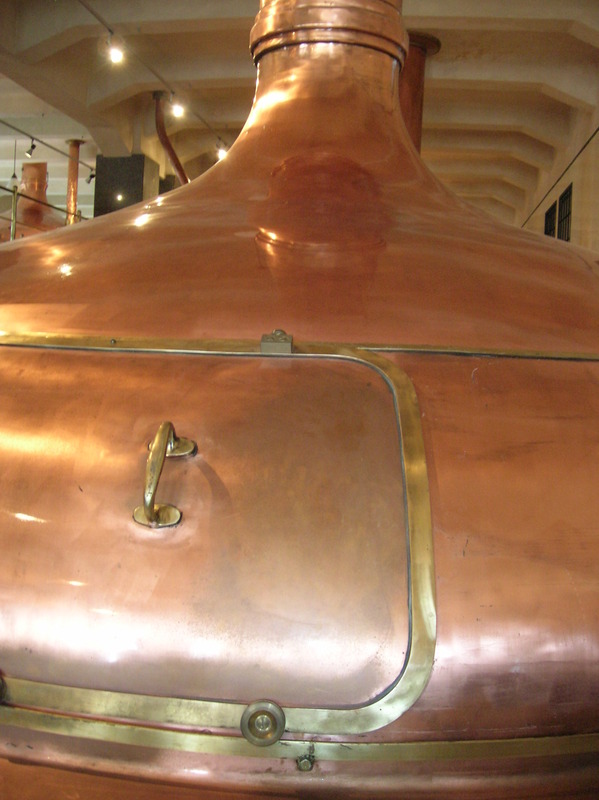 The bronze font hailed from 1430. 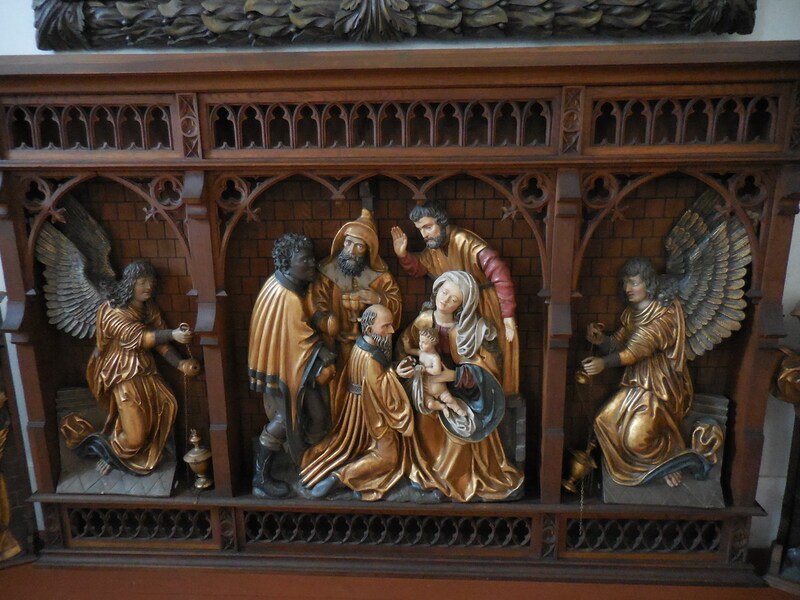 Below it I saw a relief of apostles and saints while the four Evangelists were positioned above the font. But the highlight was St. Sebald’s Tomb, almost five meters high. 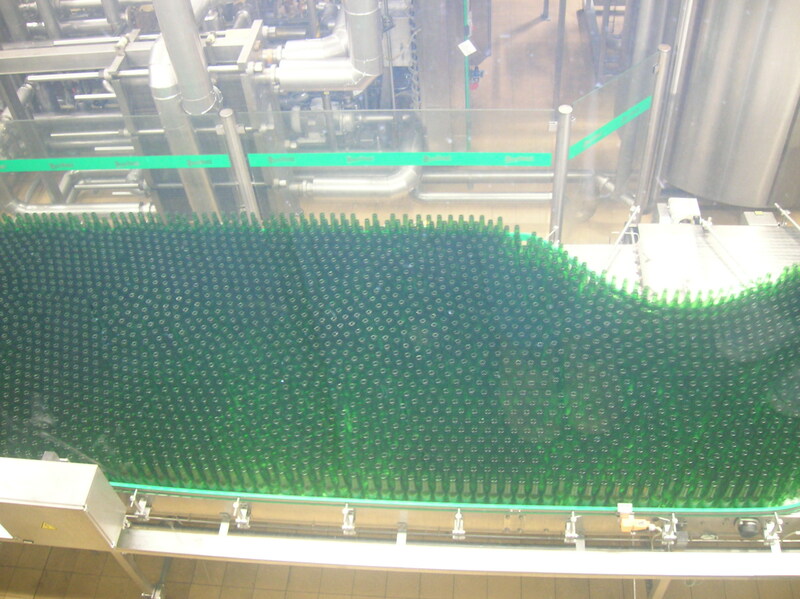 It took 11 years to build this masterpiece by Peter Vischer. 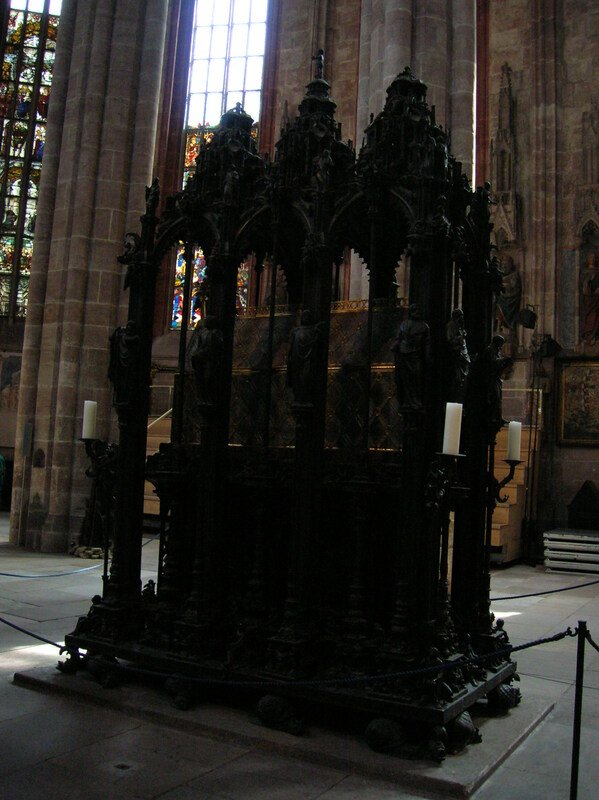 The Gothic reliquary hailed from the 14th century. The tomb was decorated with portrayals of four dolphins and 12 snails, for instance. 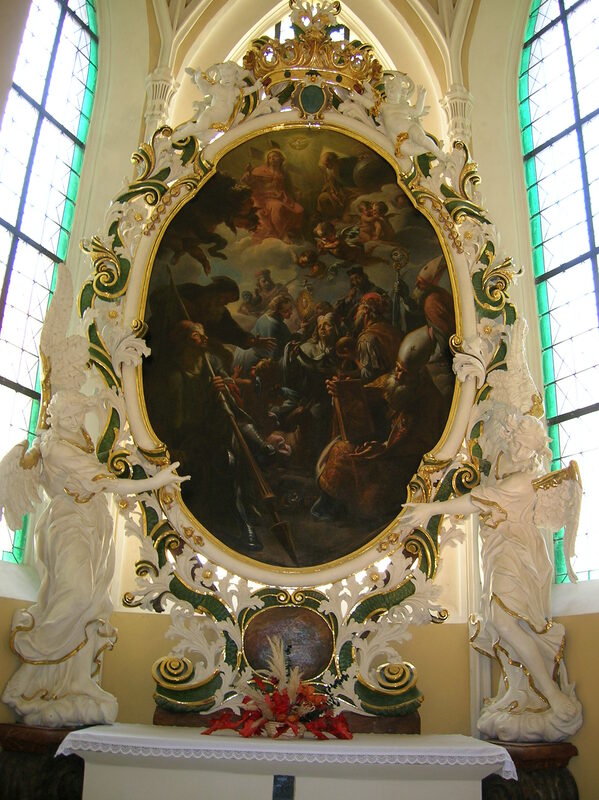 The figures of Mary, John and the crucifix on the main altar were the work of Stoss. 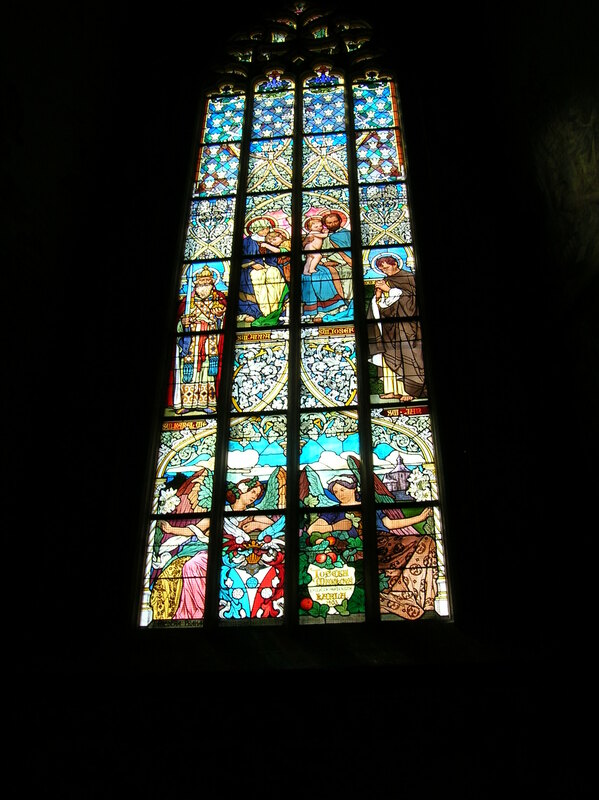 I was enamored by the glass stained windows, some of which dated back to the 14th century. It was a bit disappointing that the upper part of the windows consisted of panes of smoked glass. On one of the memorial tablets there was a view of Bamberg, another Bavarian city that was dear to my heart. St. John and Apostle Andrew were depicted, and I marveled at the curls in Andrew’s hair and the folds in his drapery. We came to the main square, bustling with Easter stalls. In front of us was The Church of Our Lady, built on the site of a synagogue that was demolished in the early 14th century, when the Jewish quarter, which had been located here, was abolished, and half of its inhabitants were murdered. It was hard for me to believe that Emperor Charles IV, the beloved King of Bohemia, had permitted the demolition of the Jews’ homes or, most shockingly, did not stop the 1349 pogrom that resulted in the deaths of so many Jews. Yet I had read that the Christian prelates supported anti-semitism, and his actions toward the Jews probably made him seem pious and dutiful to many of his subjects. 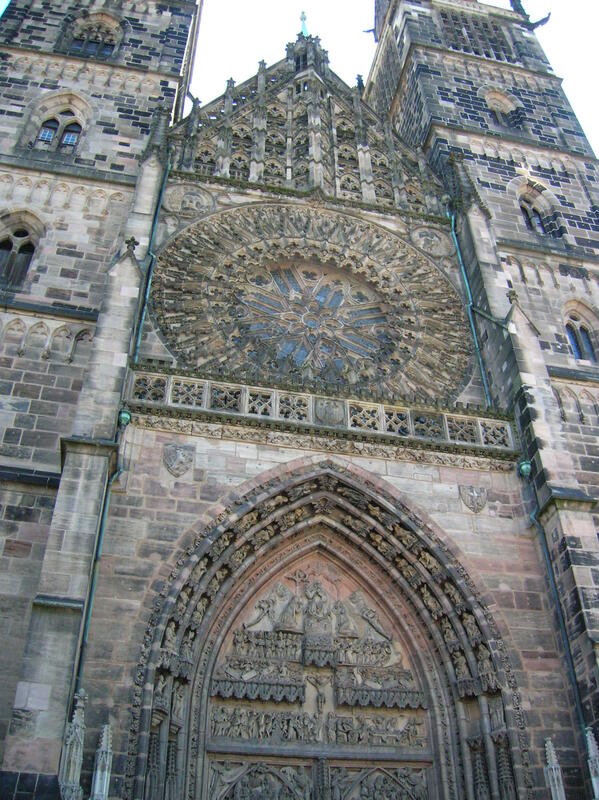 The architect of the Church of Our Lady was Peter Parler, who had been responsible for completing St. Vitus’ Cathedral in Prague, among other significant works. 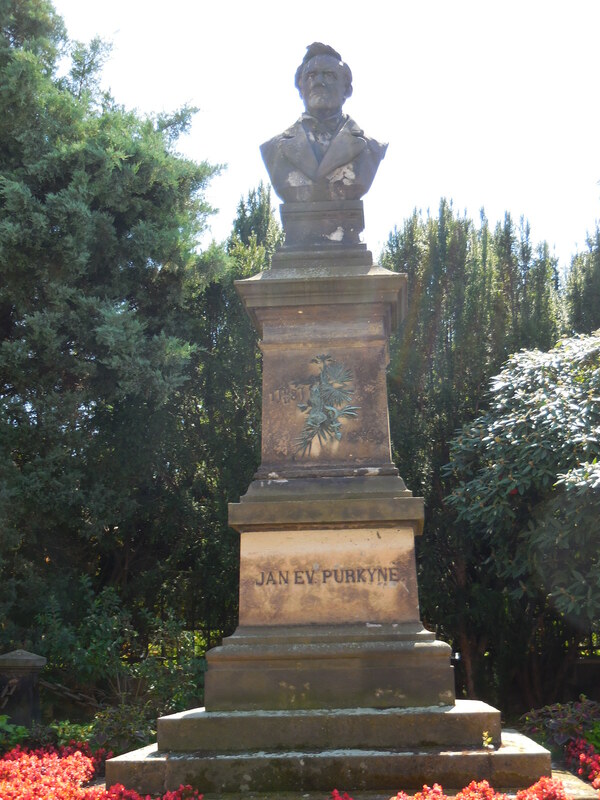 He had certainly left his mark in the Czech lands. While the church had been damaged in the Allied Forces’ bombing of the city in 1945, part of its exterior remained intact. The west façade, the portal, the choir, some of the outer walls and the sacristy did not suffer the terrible fate of its other sections. We spent some time studying the exterior. 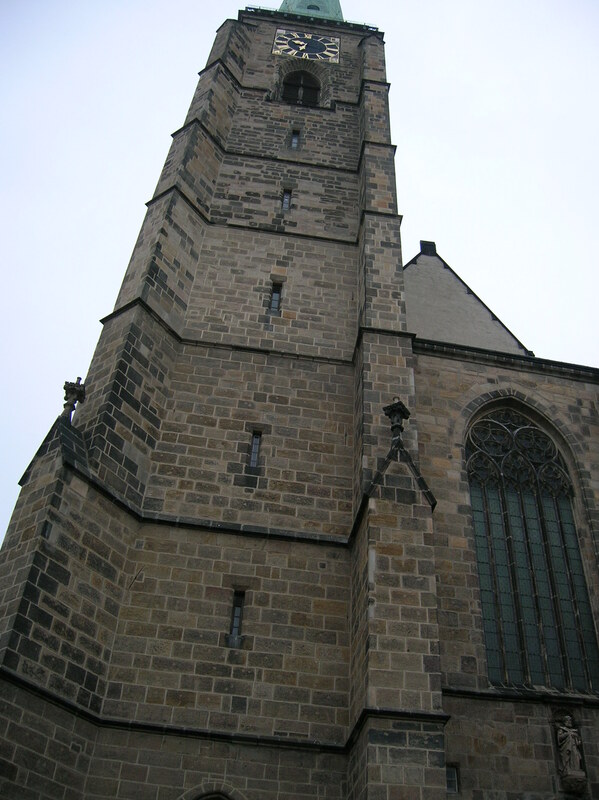 It boasted a stepped gable and neo-Gothic pinnacles plus a five-story tower. In the center the Virgin Mary was depicted with Jesus. Other figures surrounding them included Adam and Eve. Emperor Heinrich III stood out with his crown, orb and scepter. The German imperial eagle made an appearance on the balustrade. The portico boasted gilded statues, and the tympanum was richly decorated. We came to the north side with the depiction of the Foolish and Wise Virgins. 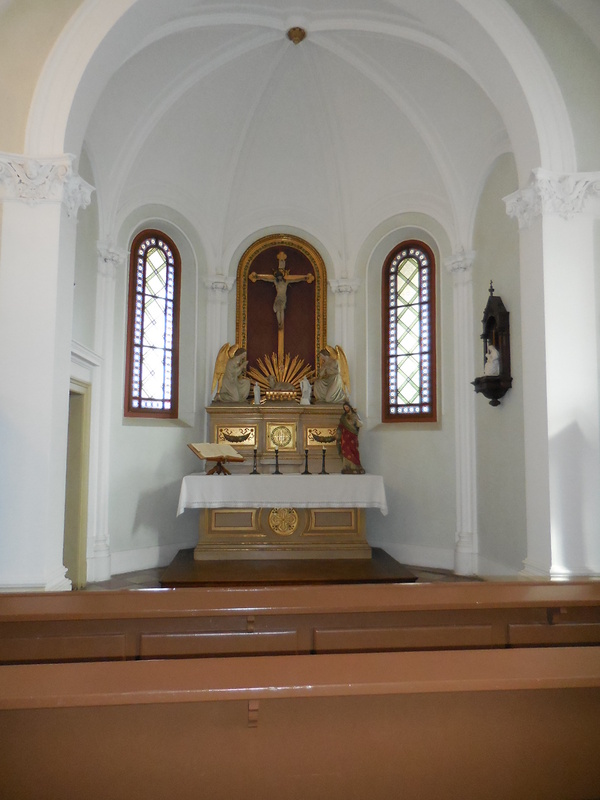 The building was one of the first hall churches in Franconia. Inside, a Star of David decorated the floor, symbolizing the expulsion and murder of the Jews during the 14th century. 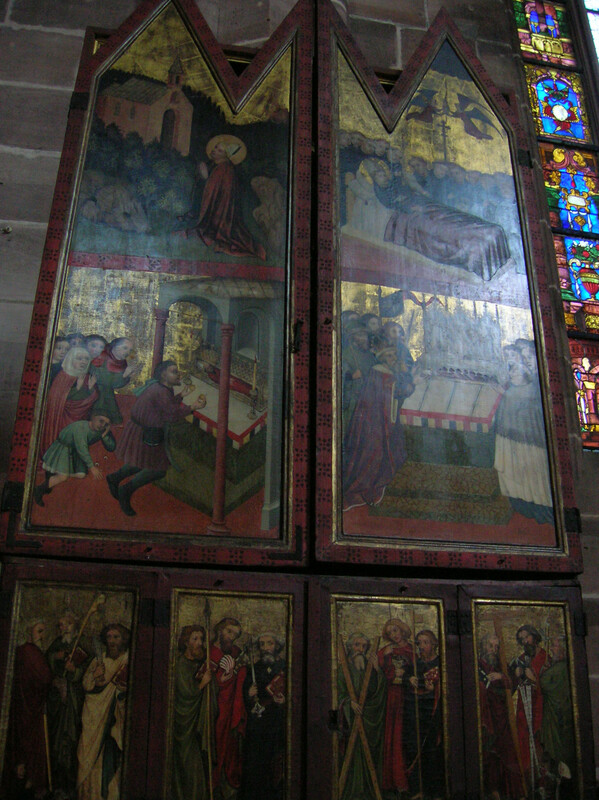 The main attraction, though, was the Tucher Altar, from the mid-15th century. It was one of the most significant artworks in the time period before Dürer. I loved the gold background of the triptych. 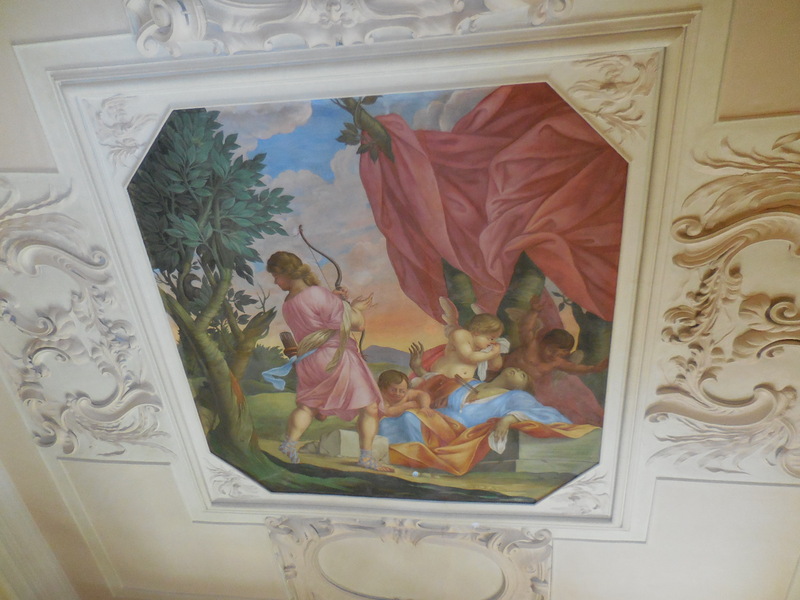 It represented the divine and also gave the panel painting a certain vibrancy that attracted me. In the central panel I saw a crucifixion scene. 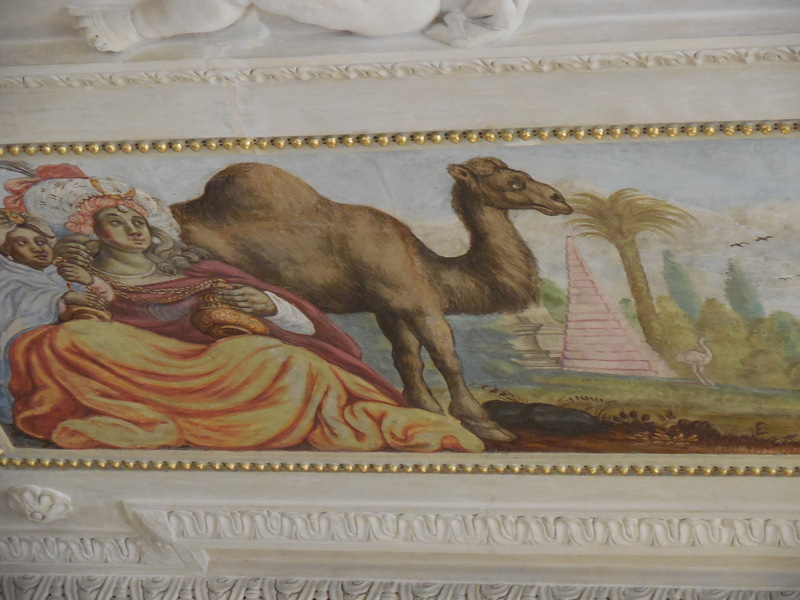 Mary and John were depicted below it. John seemed mesmerized by the scene with Jesus. On the right inside panel two holy hermits were talking to each other. I wondered what they were saying. Were they complaining that they were lonely and did not like being so isolated from the rest of the world? Or were they happy that they were recluses? I tended to be alone, and sometimes I wondered if I was really happy or if I had just accepted it as my fate. The gilded tabernacle at the base only dated from the 1980s. It was made to look like a torah roll in recognition of the pogrom. The choir featured life-size statues. Our guide pointed out to us Saint Ludmila and her grandson Saint Wenceslas, Czech saints. Wenceslas’s mother, a pagan named Drahomíra, had Ludmila, a Christian, killed because Ludmila had taught Wenceslas to be Christian. 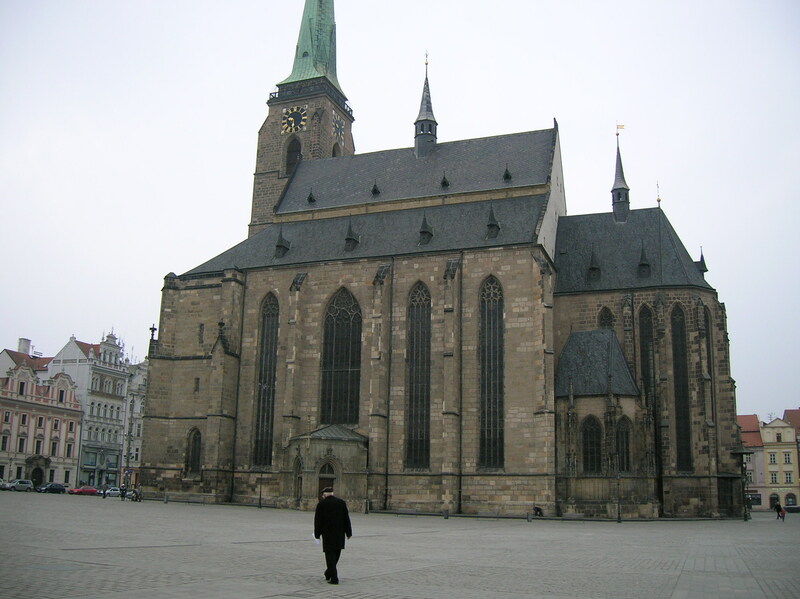 Wenceslas became duke of Bohemia and had a rotunda built to St. Vitus – later it would become Saint Vitus’ Cathedral. 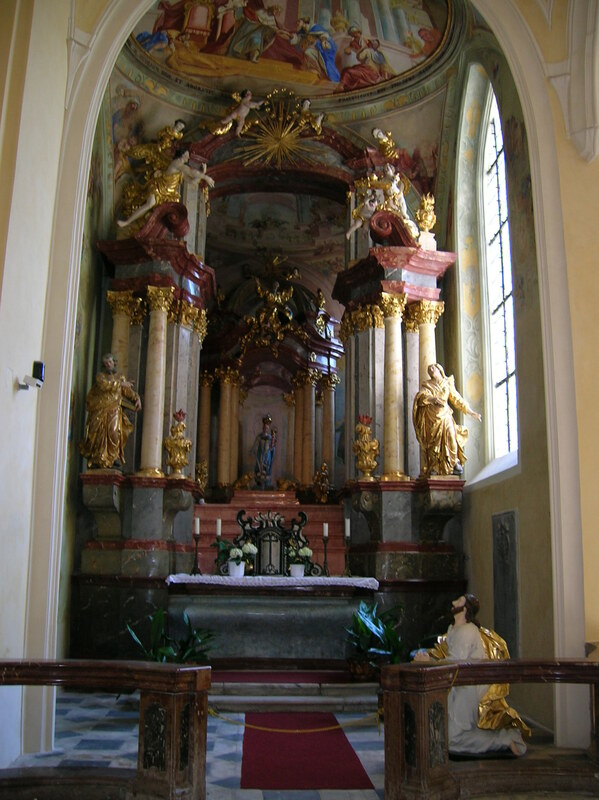 It was not so strange that Czech saints were represented in the German church. 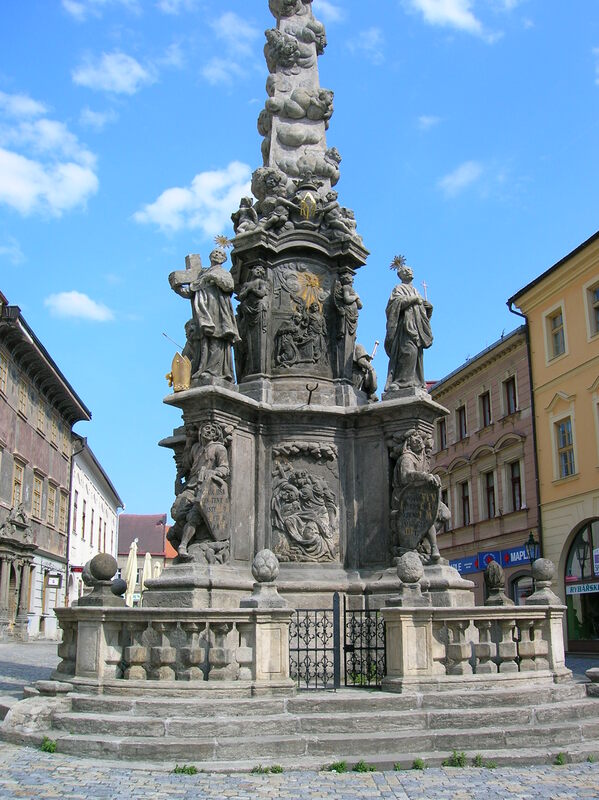 Emperor Charles IV, who established the church, was also King of Bohemia, and his mother came from the Přemyslid family, a dynasty that had ruled Bohemia from the ninth century to 1306. 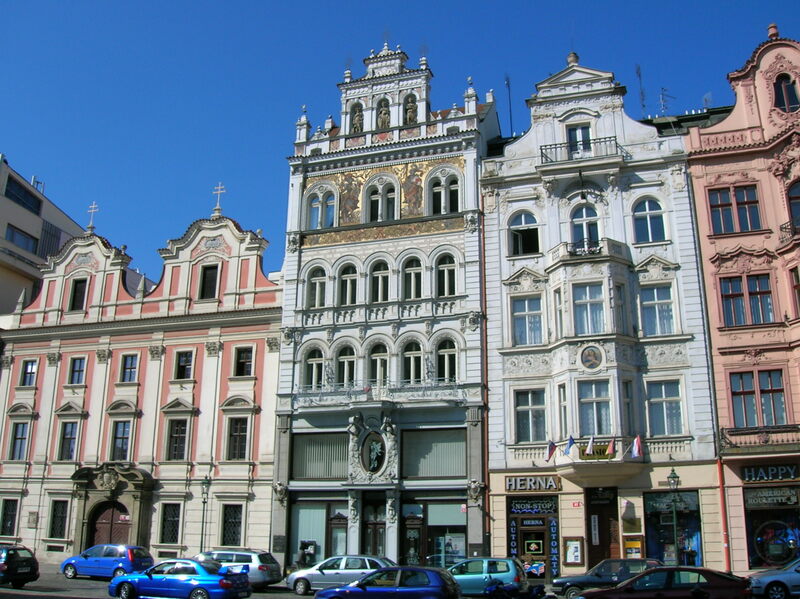 Besides, Bohemia had been a mixture of many peoples, cultures and languages. In the center of the choir I saw the 15th century creation Madonna with Rays as rays of the sun shone on the Virgin Mary and Jesus. In the portrayal the Virgin Mary was stepping on a human face as she stood on a crescent moon. 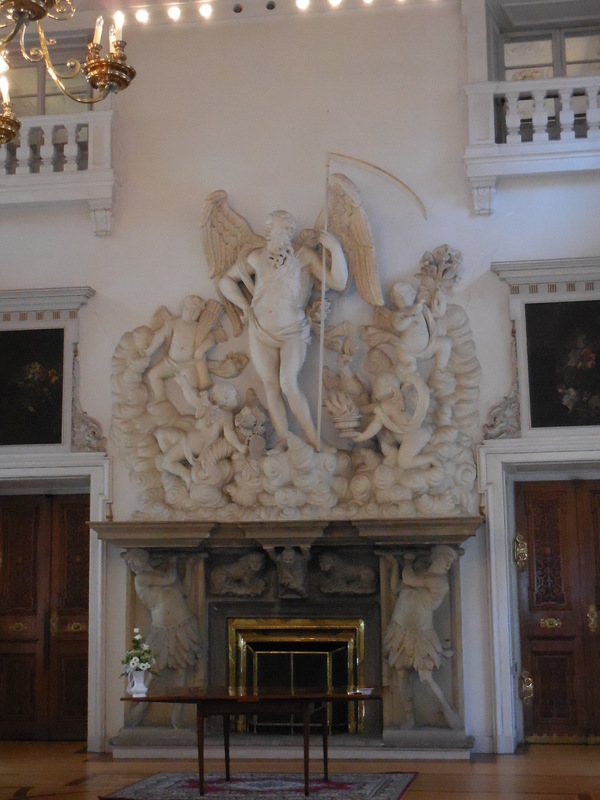 There were also 18 sculptures of tranquil angels gripping candlesticks on the sides of the choir. One of the keystones featured a rare scene of Jesus going to school as Jesus was portrayed as human. In the nave I found some epitaphs by Kraft. We had some minutes before the noon scene at the clock, so we admired the Beautiful Fountain, constructed at the end of the 14th century. Over 17 meters high, it boasted 40 stone figures on four levels. At the bottom there were the seven arts and philosophy. 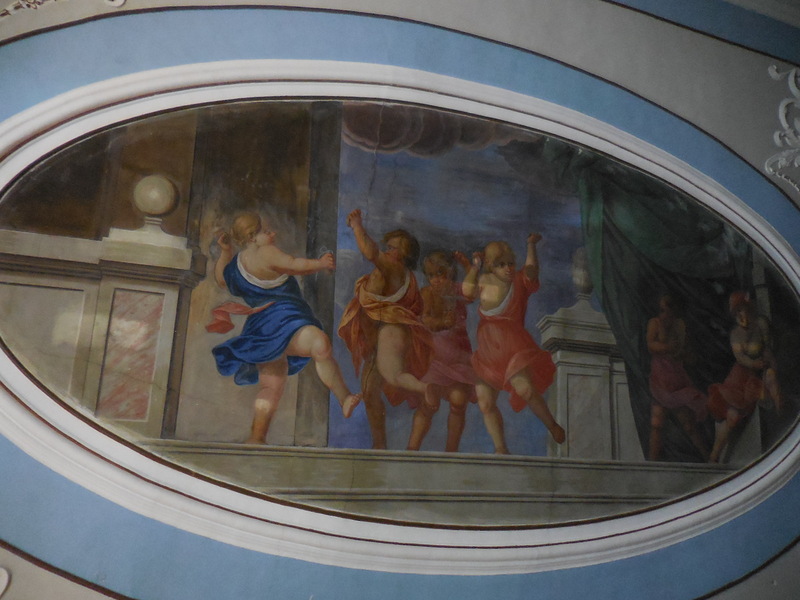 The Four Evangelists made an appearance, too. The seven electors, Hector, Alexander and Julius Caesar were also sculpted in the central part. Old Testament figures were also present along with Charlemagne and King Arthur. The top part showed Moses and the seven prophets. 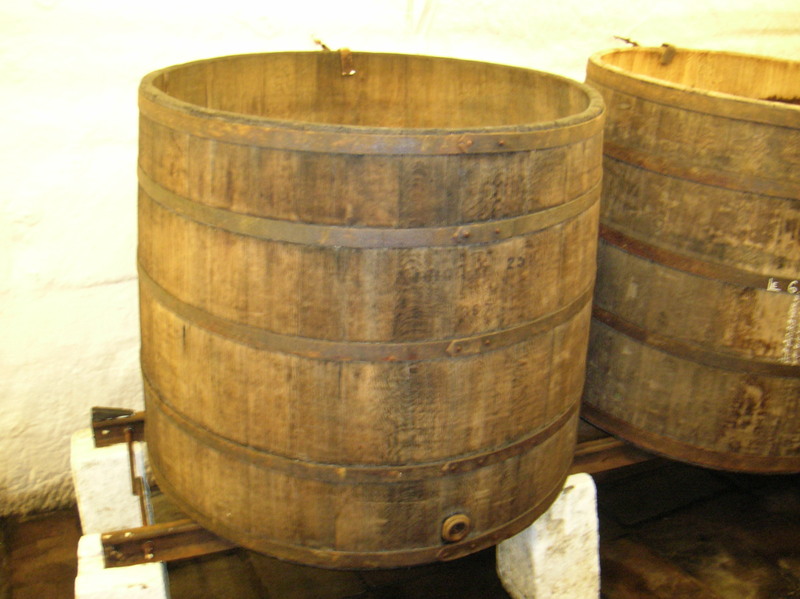 The well was a copy from the early 20th century. 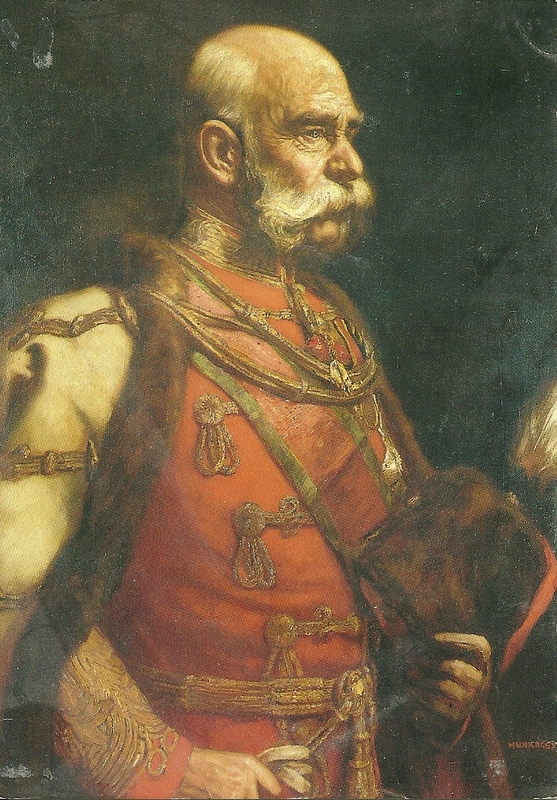 The original was in the German National Museum. 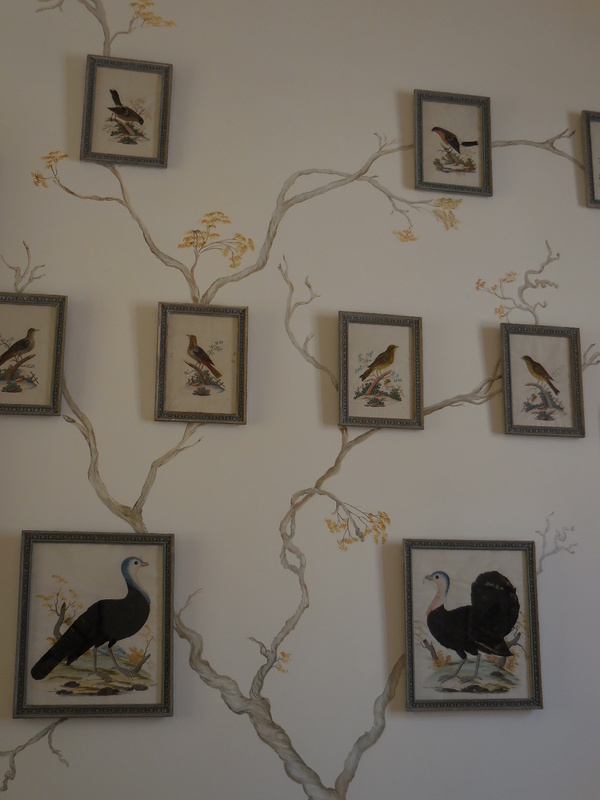 I admired the decoration and latticework. There was also a Wishing Ring that could be turned, and many gathered around the well climbed up the steps to turn the ring three times for good luck. We watched the noon scene at the clock tower. Trumpeters announced the arrival of Emperor Charles IV, and the seven electors paraded around him three times, symbolizing the “Golden Bull” decree that made Nuremberg the seat of the first imperial diet when the seven electors selected a new German king. 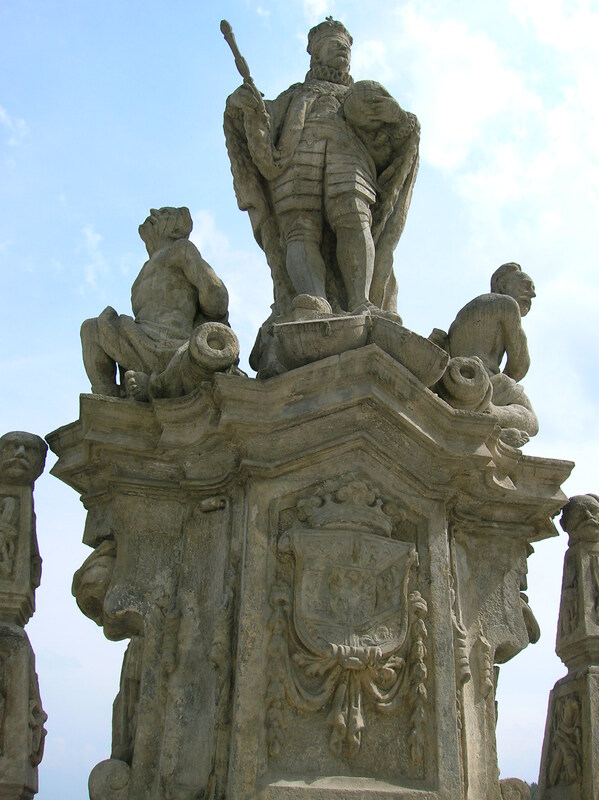 It was nice to see King Charles IV appreciated in a country other than the Czech lands. I decided I must come to the famous Christmas market in this square someday. It must be enchanting. I tried to imagine knights’ tournaments that had taken place in the square so many centuries ago. Or I tried to imagine the days when the imperial crown jewels had been shown to the public on this square. History sure seeped through the heart of this city. 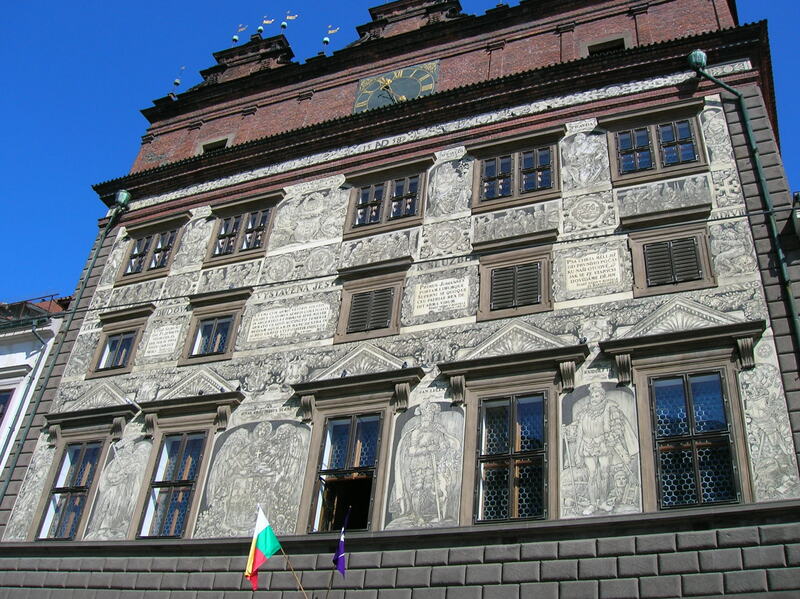 Before lunch we went to admire the Italian Renaissance style Old Town Hall, which hailed from the 17th century. The figures of Wisdom and Justice adorned the façade. 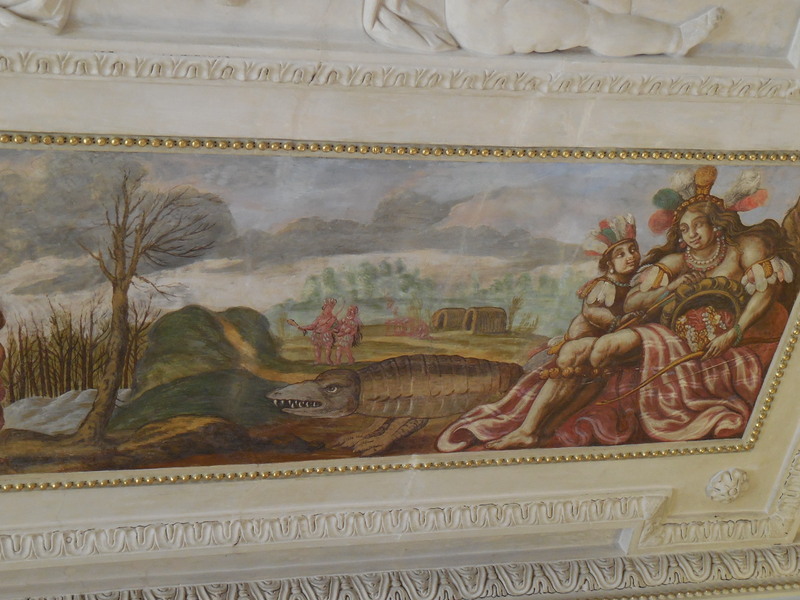 We even got inside to the Great Council Chamber, which was not often open to visitors. 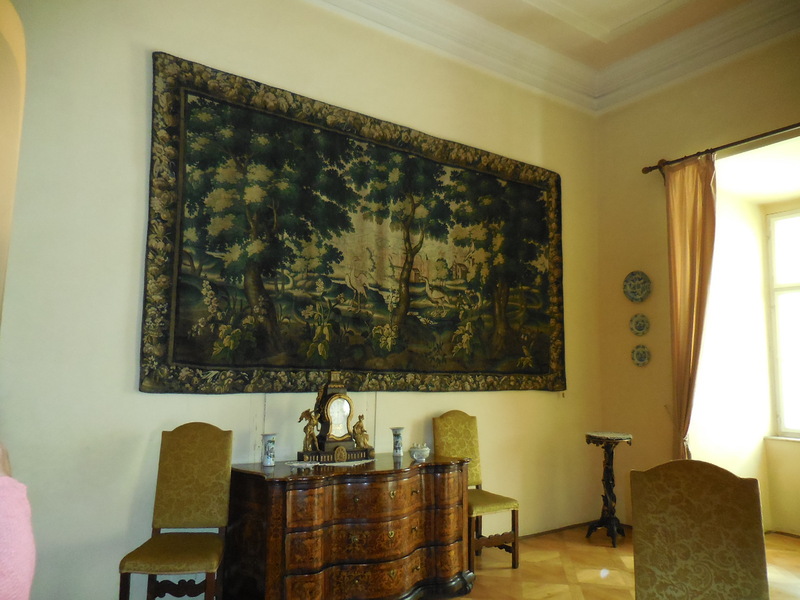 Renaissance in style, it was 40 meters long. I admired the timbered ceiling. It was a reconstruction. The original had had burned down in 1945. I thought of all the council meetings, trials, balls, imperial assemblies and signing of peace treaties that had taken place here over so many centuries. If only I could have been a fly on those walls! 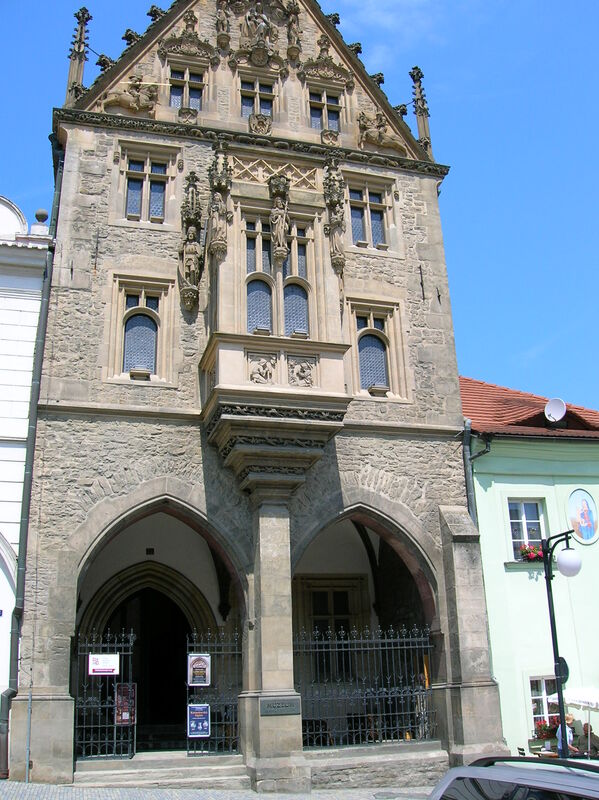 Another Old Town Hall dated from 1330 and was an example of Gothic architecture. Visitors could tour the dungeons underneath it. For lunch I found a small café where I could munch on a sandwich after devouring a large soft pretzel from a stall. Next up was the medieval castle. Dominating the city, it looked romantic, perched on a rocky hill. 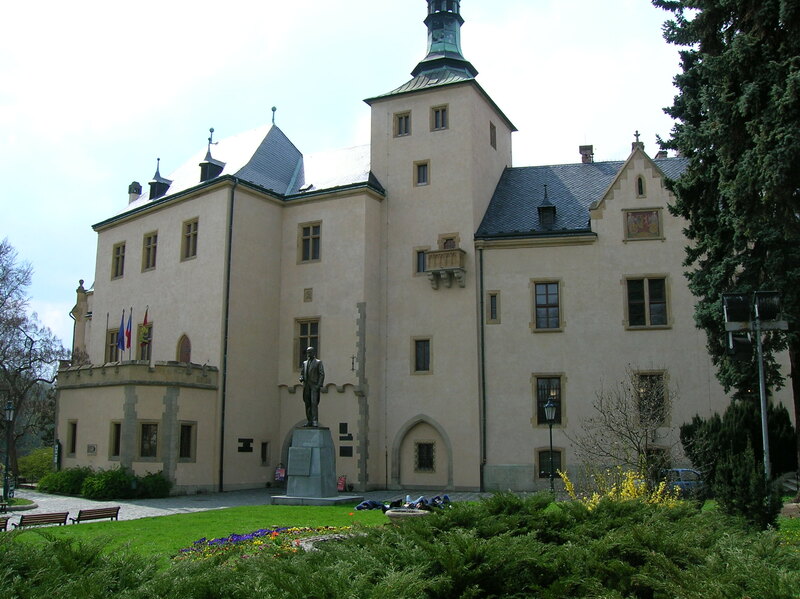 The castle dated from the founding of the city, before 1050, when a fortress was situated on the site. Every German emperor set foot in this structure from 1050 to 1571. The imperial crown jewels had been stored in this fortification with four towers. While walking uphill toward the ticket office, the views of the rooftops and town were superb. Half-timbered buildings were on the premises, too. I liked the look of these buildings; they reminded me of cottages and had a very intimate quality. It was possible to climb Sinwell Tower, though I did not feel like trying to conquer my fear of heights on this day. Soon we entered the Imperial Palace. The highlight of the interior was the Romanesque double chapel, hailing from the 12th century. 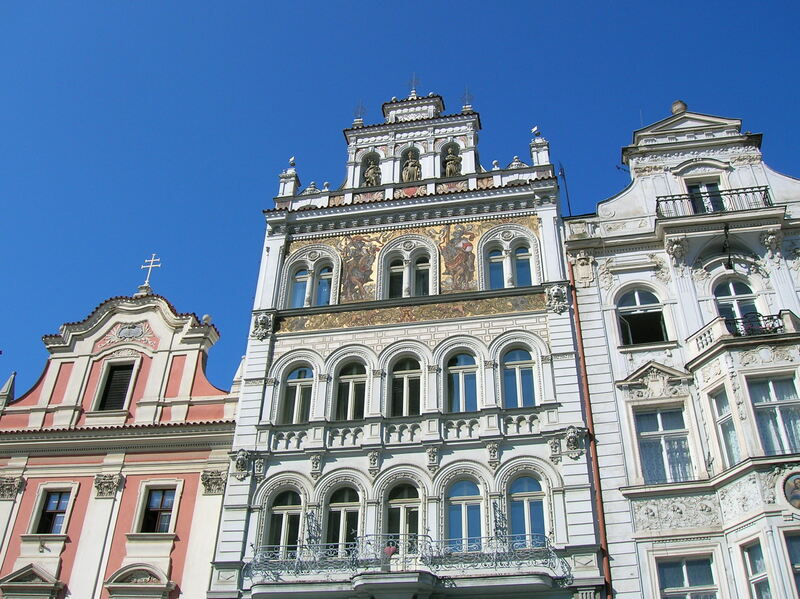 Twin chapels, featuring a hall structure with two spaces on top of each other, are rare; there are only about a dozen in all of Central Europe. The emperor and his entourage entered from the Gothic portal of the upper level while the commoners came inside from the outer courtyard. On one capital there was a grotesque decoration of animals’ heads spouting leaves. 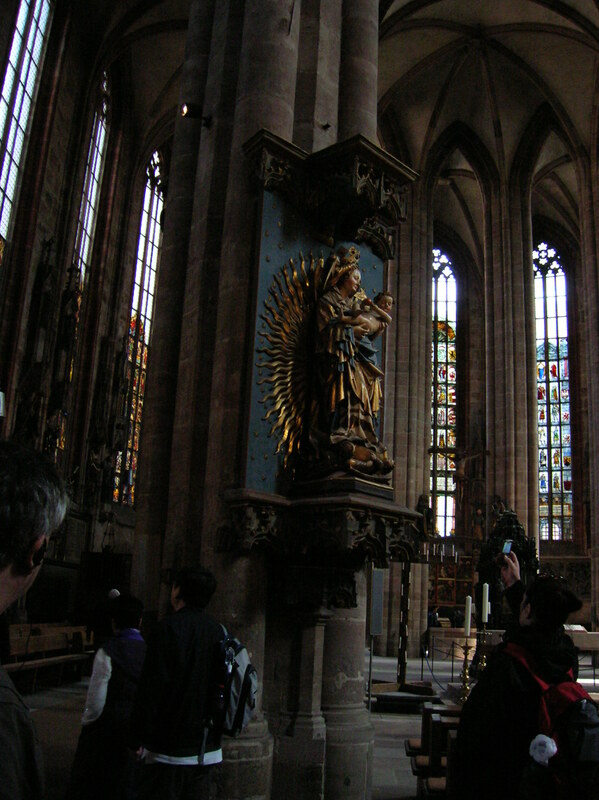 A 15th century statue of the Madonna was on the main altar. Statues of four rulers were also present in the chapel. 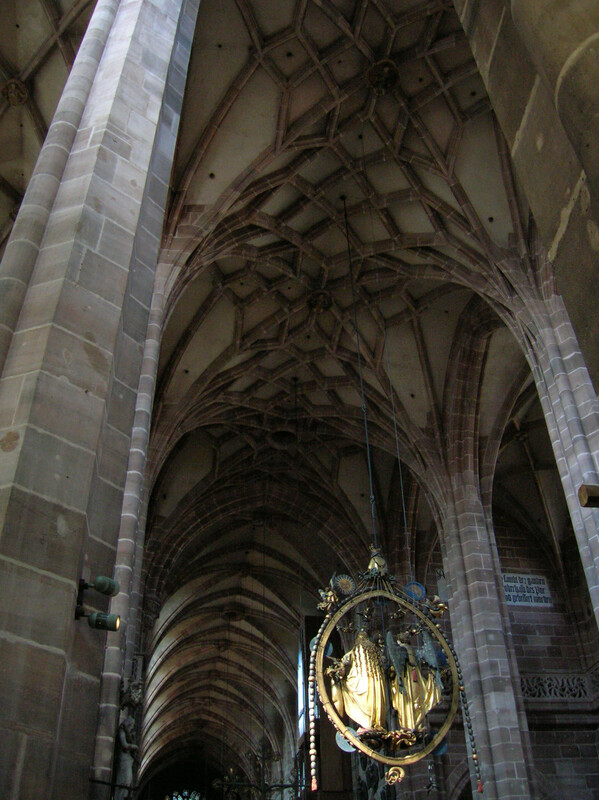 In the gallery above there were three bays with groined vaulting. What impressed me most in the other rooms were the ceilings. 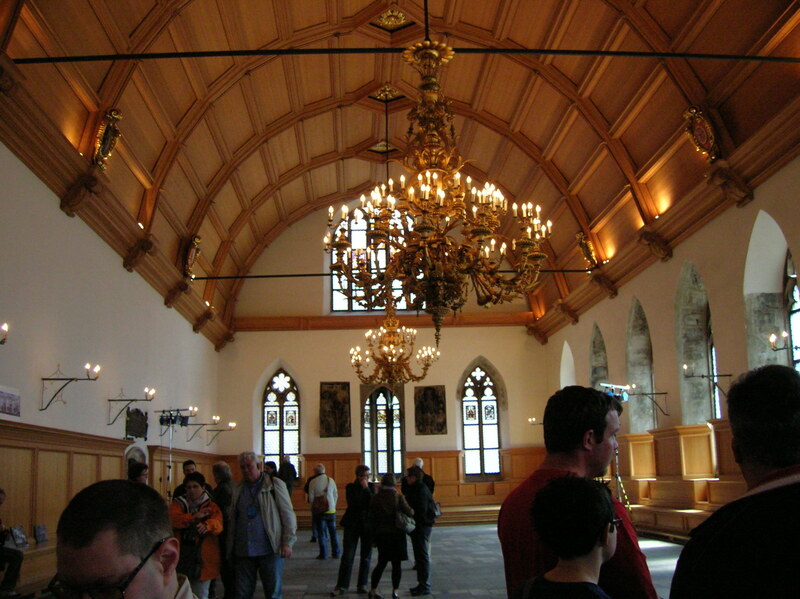 The Knights’ Hall had an impressive massive joist wooden ceiling with no less than 30 crossbeams. Wall paintings from 1490 decorated both sides of the Late Gothic portal. Christ represented as a ruler was portrayed above the arch. The Emperors’ Hall featured a black-and-yellow ceiling with depictions of the imperial double eagles. 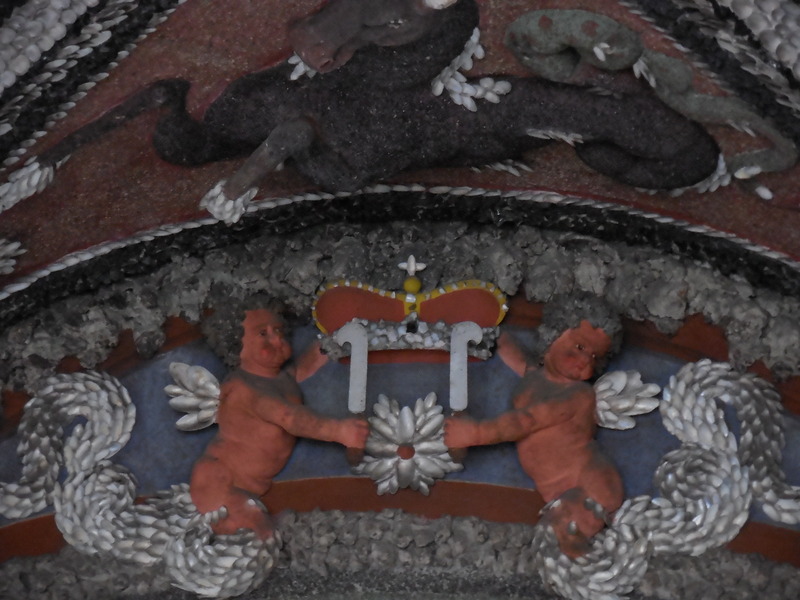 Coats-of-arms adorned the ceiling, too. A small green stove caught my attention, too. 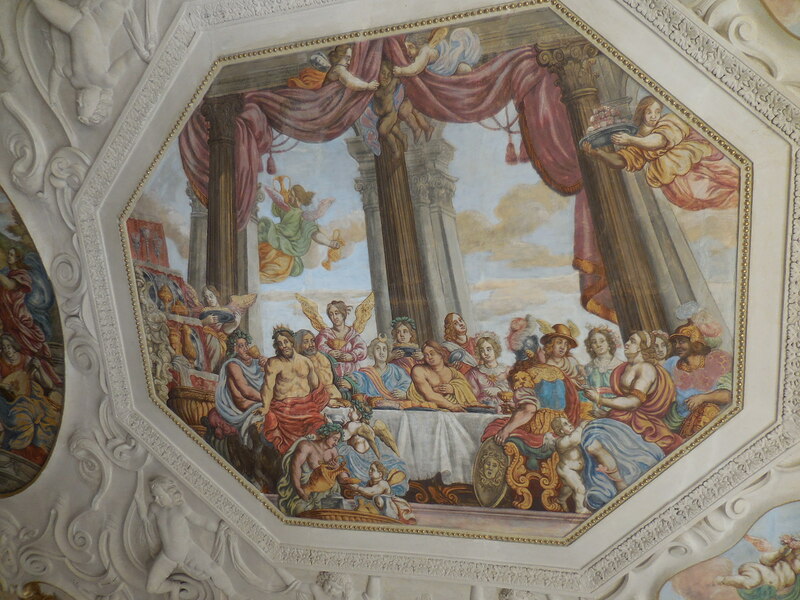 Allegories of the liberal arts and portrayals of emperors decorated it. 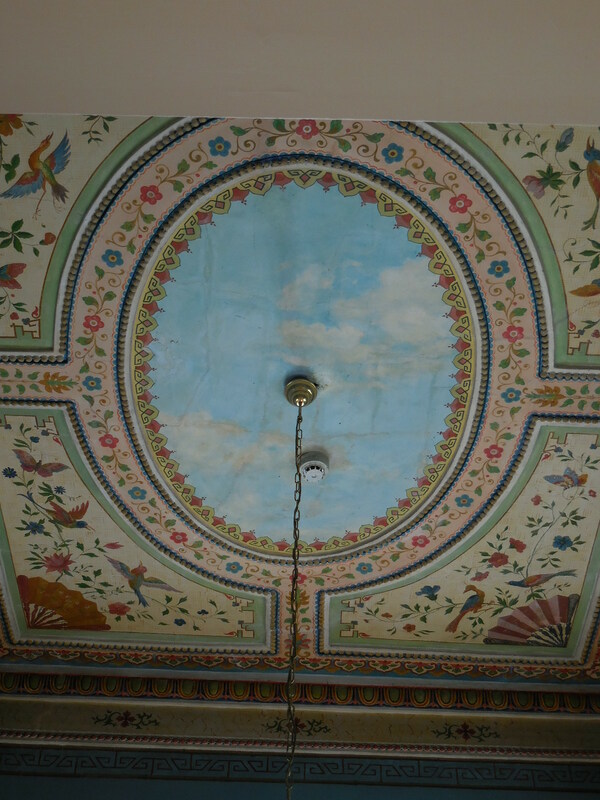 The Imperial Reception Hall had a painted imperial eagle painted on its ceiling. 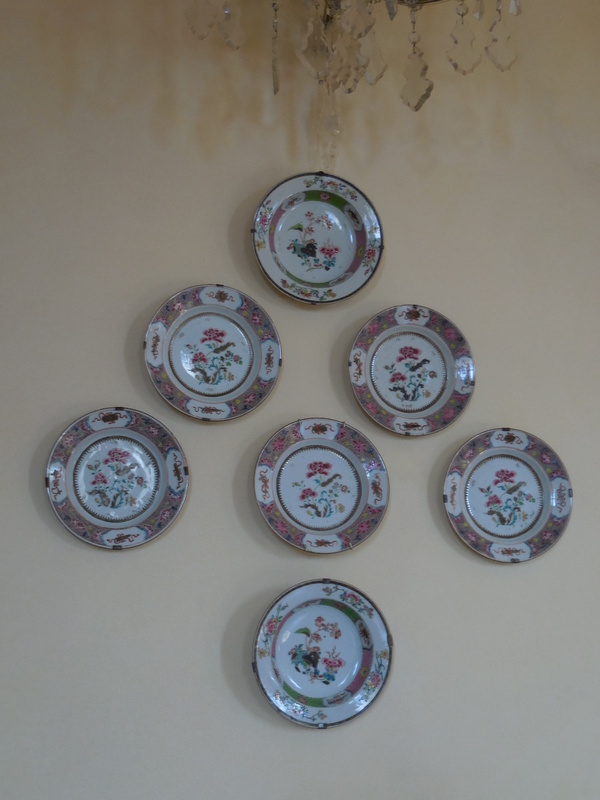 Its wall paneling was adorned with rosettes. 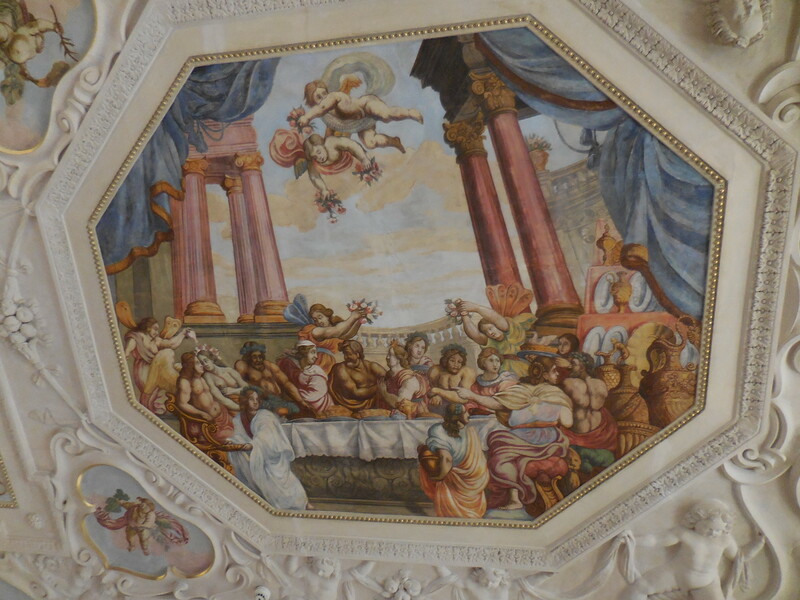 The ceiling hailed from the 15th century, and the furnishings were Renaissance in style. 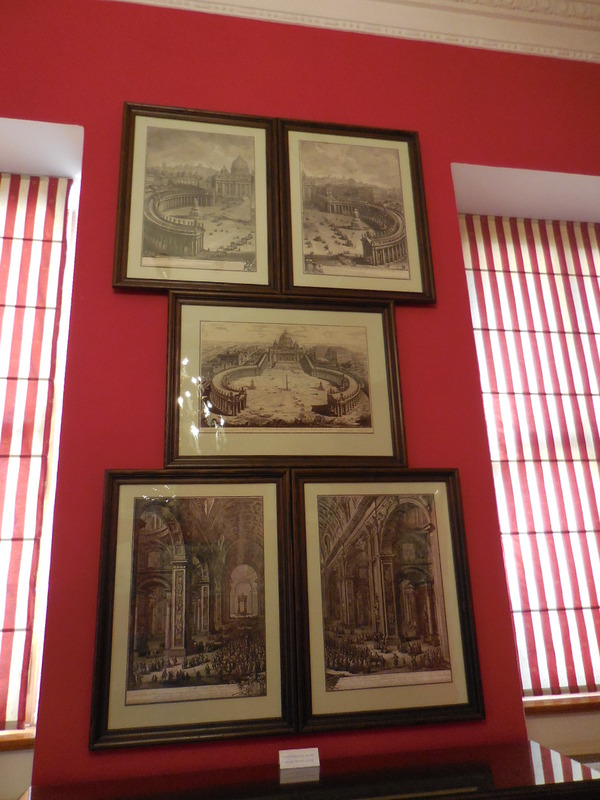 An exhibition featured how the emperor interacted with the empire and with the city. It explained the Golden Bull’s significance, the role of the electors and how Nuremberg had flourished during the Middle Ages. 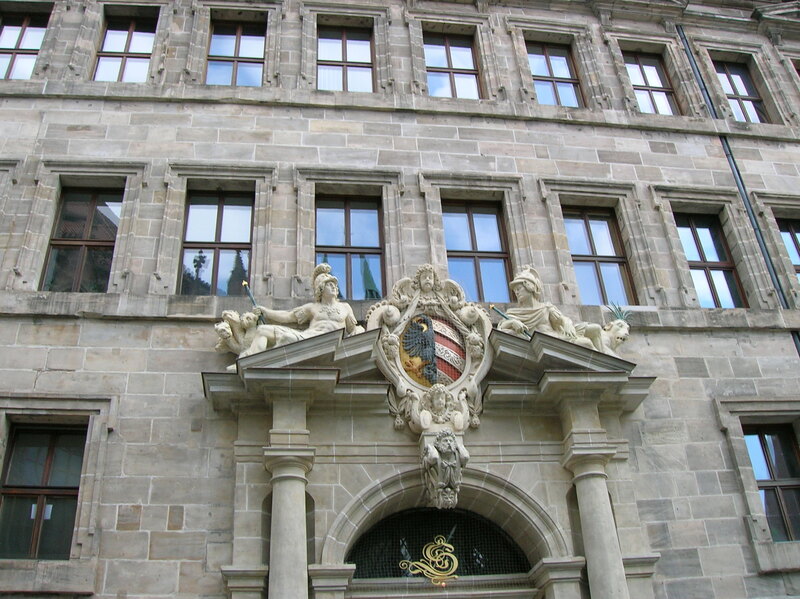 After the tour of the castle, the other members of the group went to the German National Museum, the largest museum of German art and cultural history. I opted to visit Dürer‘s former home, a 15th century house that now was a museum dedicated to the artist. Dürer was so dear to my heart. 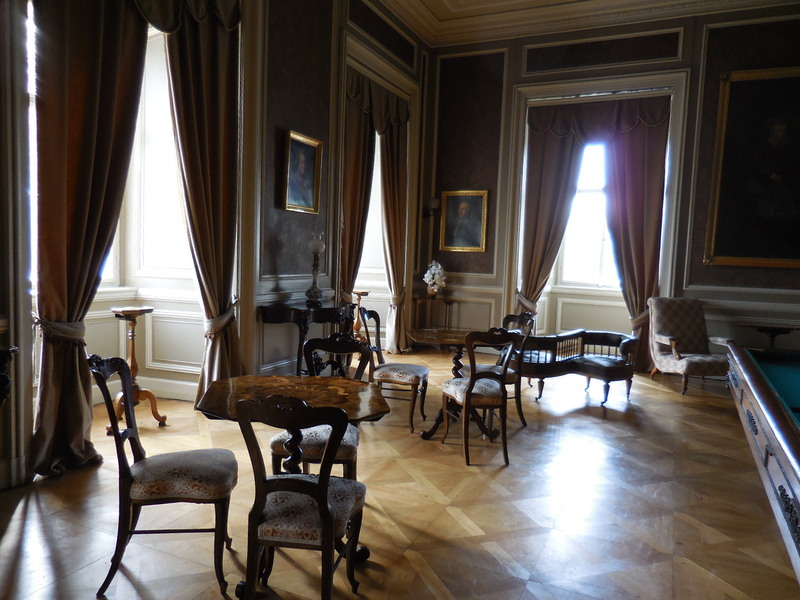 I also did not think that two hours was enough time for me to visit the German National Museum, where the largest collection of pianos plus paintings and sculptures through the ages, were exhibited. I was also tired. I had woken up at 3 am, and I wanted to visit the museum when I had more energy and would appreciate the exhibits better. 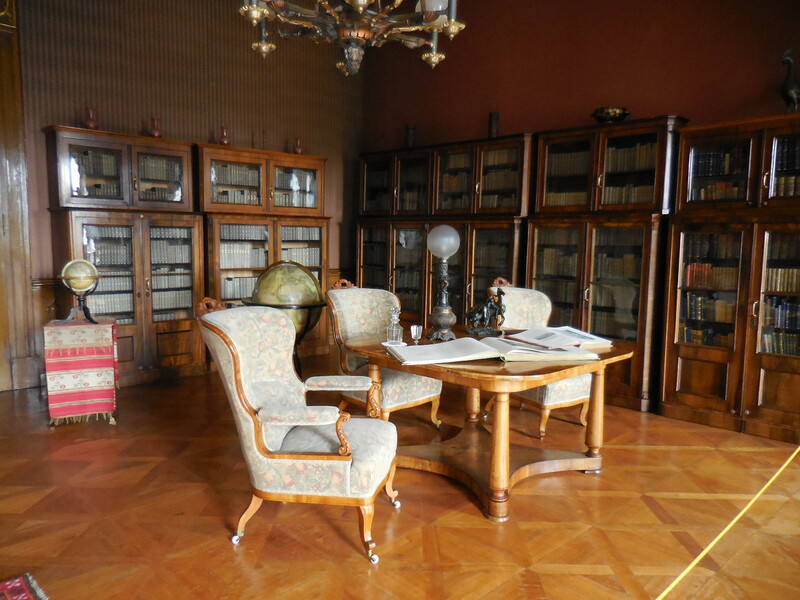 The Dürer Museum displayed reproductions of the artist’s copperplates, portraits, etchings, sketches and woodcuts. 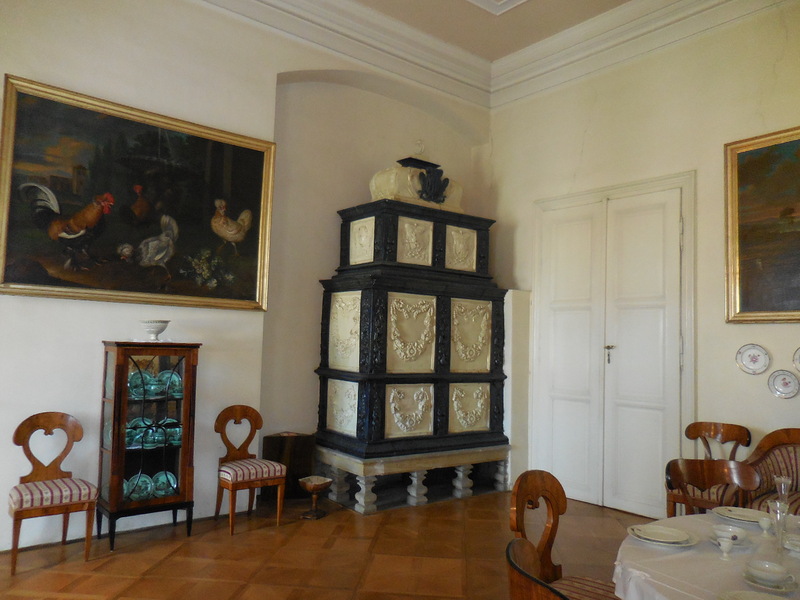 The furniture hailed from the period when Dürer lived there, from 1509 until his death in 1528. It was a small, though intriguing, museum, and I also learned about Dürer’s life. I did not know that at the German National Museum originals of his work were displayed, but I was glad I had gotten a glimpse into the life and work of an artist I truly admired. I had about a half hour free after that, so I sat at the outdoor seating of a restaurant and had one of my favorite foods, a hamburger. I watched the comings and goings of people at the Easter Market, which was filled with such joy and celebration. I loved seeing the city while a market was taking place. It gave the town even more energy. 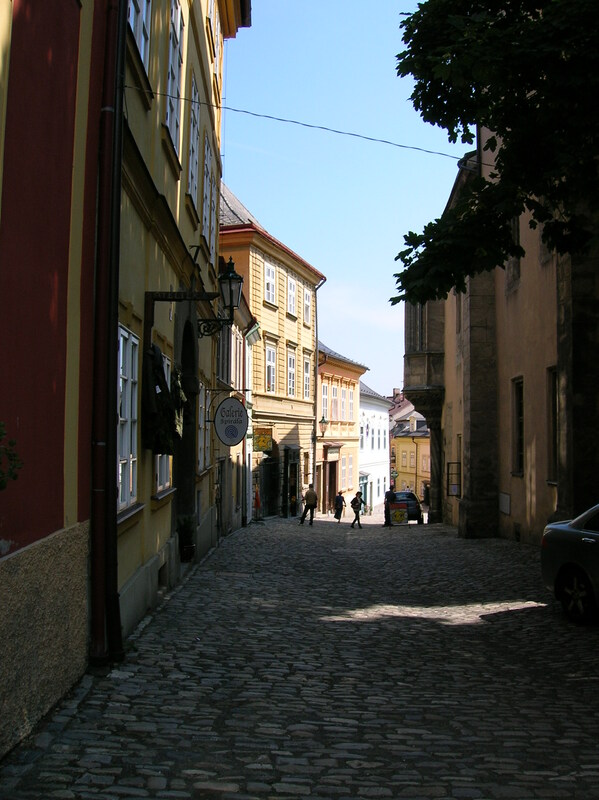 Then I walked down a few of the narrow, picturesque streets before heading to our meeting place, the German National Museum. I was more than satisfied with the day trip. We had had a superb guide, and the sights had been remarkable. I loved the churches the most, especially the rose window and the Annunciation grouping suspended from the ceiling. I bought a booklet about the city and found out that there was much more to see –a tour of underground Nuremberg and the Art Bunker ranked high on my list along with the German National Museum. Yes, I knew I would be coming back to Nuremberg. 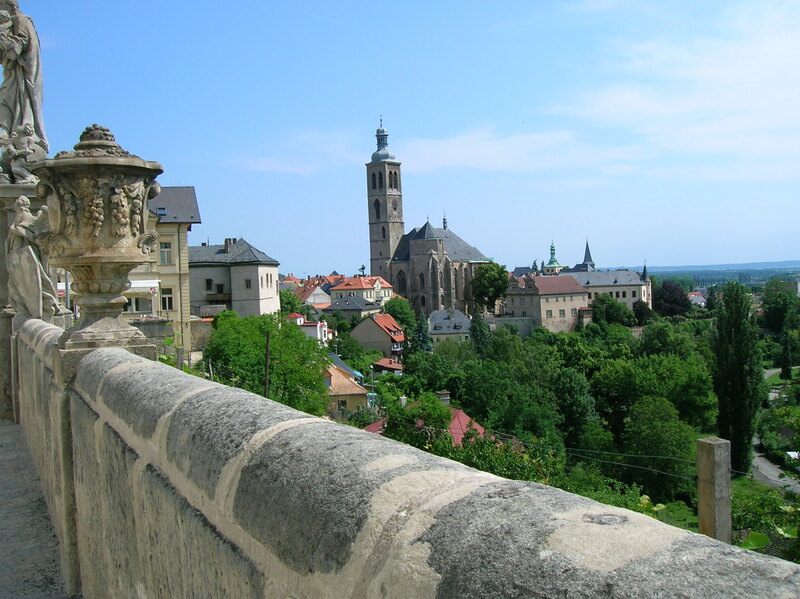 I had visited to the medieval, former mining town of Kutná Hora back in 1992. I recalled exploring the mines, touring the awe-inspiring cathedral and gazing at the Italian Court. 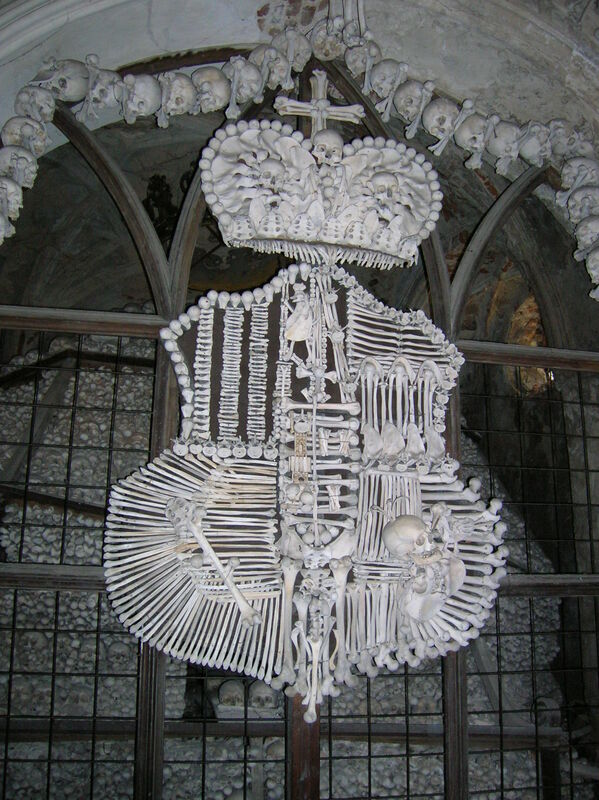 I could not forget my visit to the creepy ossuary with shapes made out of human bones. Still, it had been a long time ago. So, in 2012, I decided to return to this special place that for some reason I had not made time for during so many years. I sharpened my knowledge of the town’s history during the one and a half hour bus ride on that perfect, sunny morning. 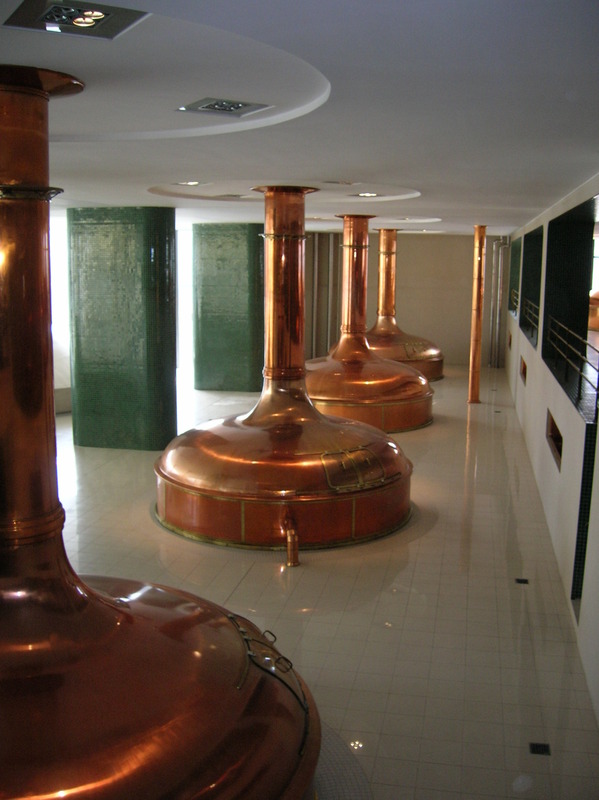 Kutná Hora gained recognition thanks to its silver mines from the 13th to 15th centuries. At one time, the town’s mine in was the deepest in the world. 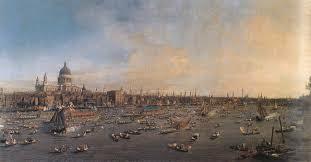 There was an international demand for its silver, which was exported to one-third of Europe. 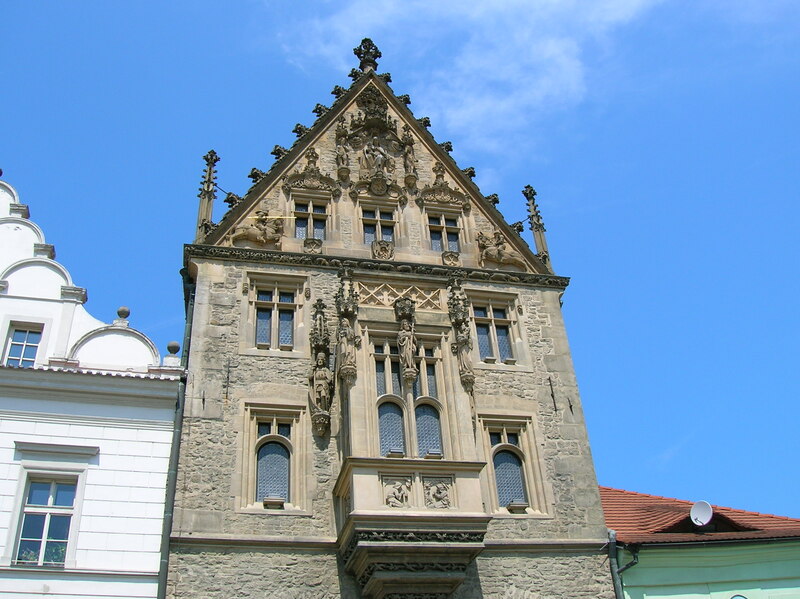 During Kutná Hora’s golden days of the Middle Ages, the Prague Groschen, a significant currency in Europe, was produced here. 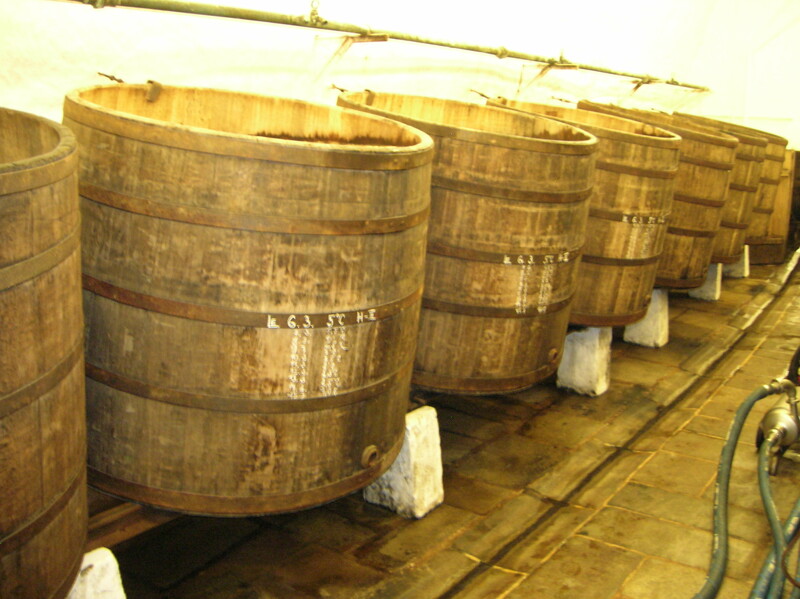 Even after the turbulent years during the Hussite Wars in the 15th century and during the Thirty Years’ War of the 17th century, mining in Kutná Hora preserved. The mine was not even shut down from World War II to 1991. 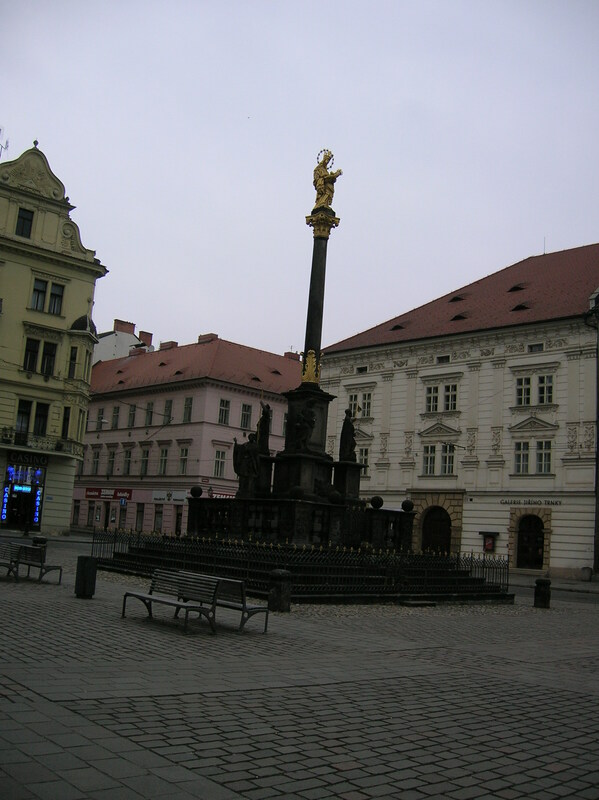 I came to the downtown area and soon found myself at the plague column where impressive statues twisted and turned. 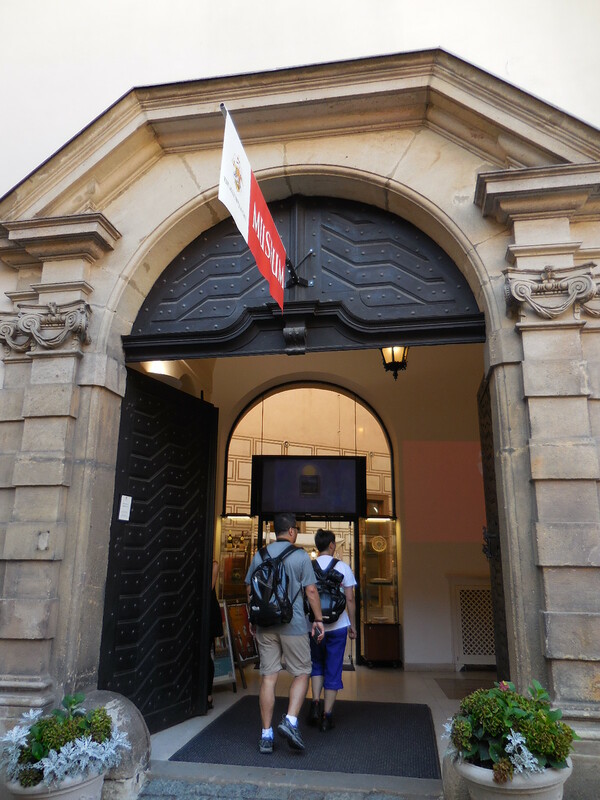 Then I headed for Saint Barbara’s Cathedral, passing the art museum in the former Jesuit College that hailed from the 18th century. 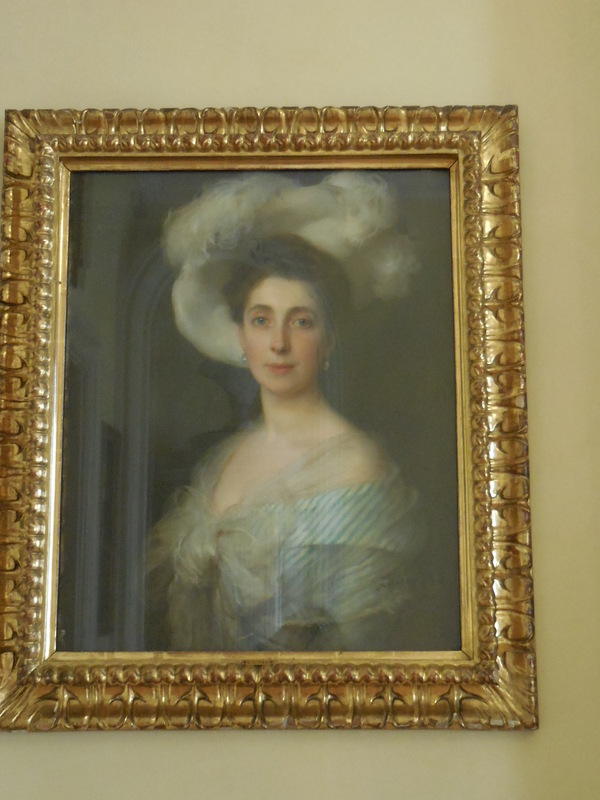 Unfortunately, I did not have time to peruse the art collection during that excursion, but I promised myself to make another trip there in the near future. Too many other sights awaited me on that day. I admired 12 statues of saints, forged from 1650 to 1716, on the way to the impressive cathedral. I could not help noticing the cathedral’s outer buttresses. The gargoyles and monsters on the neo-Gothic façade were imposing, defending their holy site from evil. (By the way, I love Neo-Gothic!) I had familiarized myself with the history of Saint Barbara’s. Its past had much to do with mining. 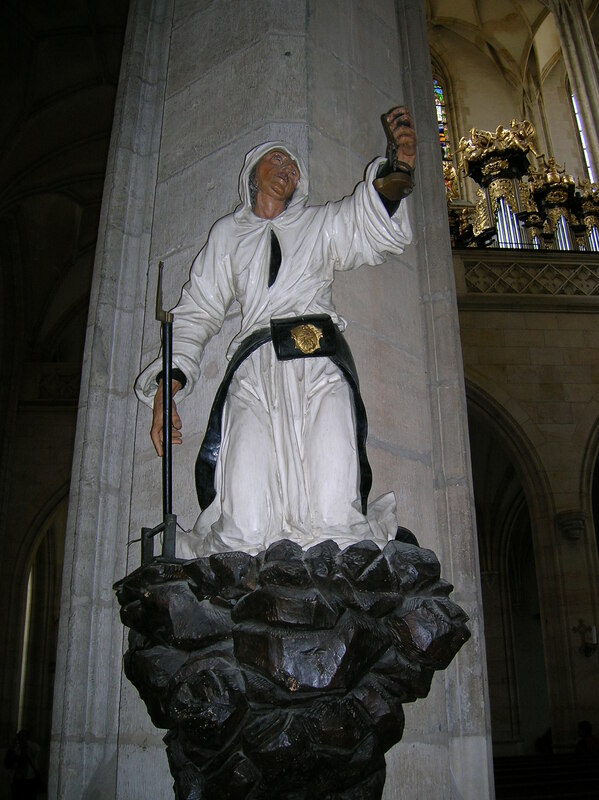 The cathedral was even named after the miners’ patron saint, Barbara. Although construction started on the cathedral in 1338, it was not completed until 1905. The building was as I had remembered it – absolutely stunning. Once again I marveled at the many Baroque works of art, including three Baroque chapels and a magnificent Baroque organ case. I was particularly drawn to the oldest piece in the cathedral, a statue of Our Lady Enthroned, hailing from 1380. Flanked by two angels in mid-flight, the gold-clad Our Lady gripped a golden orb. The stained glass windows did not disappoint, either. 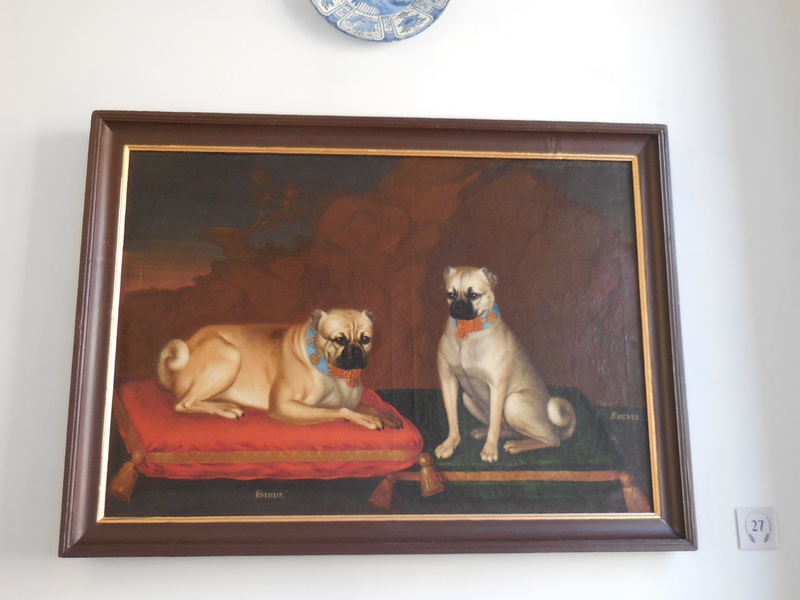 They were exquisite, dating from the end of the 19th century and the beginning of the 20th century. I spotted the cathedral in the background of two of the windows. I also noticed soldiers on horses raising their swords. Then I came to the unique late Gothic frescoes focusing on the mining profession. I had not seen art with a mining theme anywhere else. In the Mint Chapel frescoes from the 15th century depicted miners making Prague Groschens, striking the coins with mallets. That made me think of how my favorite painter, Pieter Bruegel the Elder, portrayed people at their trades or in scenes from everyday life. A few weeks earlier I had visited the Kunsthistorisches Museum in Vienna, where I had feasted my eyes on 12 canvases by the masterful Bruegel the Elder. “The Battle between Carnival and Lent” came to mind. In this depiction celebrating humanity and peasant life, the artist set the scene at a market and church squares. Mass had just ended, and the churchgoers carried their chairs out of the holy building. Crippled people begged for money in front of the church. A corpulent man dressed in pink and yellow stockings was playing a guitar and wearing what looked like a ceramic pot on his head. 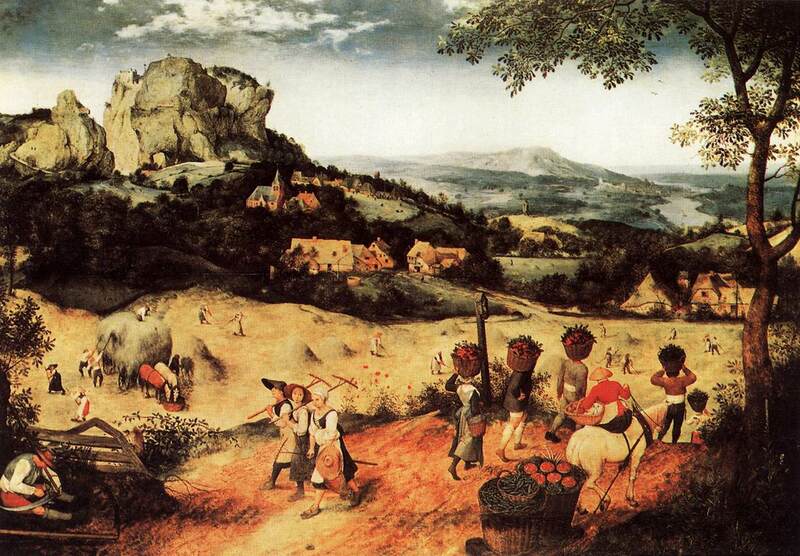 Bruegel the Elder’s “Seasons of the Year” cycle was another of my favorites. 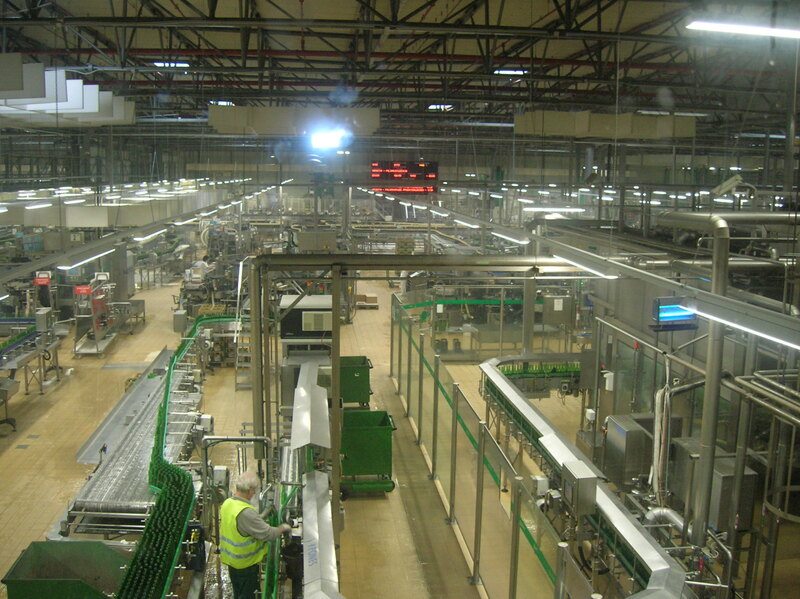 It focused on activities in the countryside. I thought of the depiction of winter, “Hunters in the Snow,” and the hunters in the scene that visually and poetically described man’s relationship to the last season of the year. “Peasant Wedding” also showed the lower class at their trades. 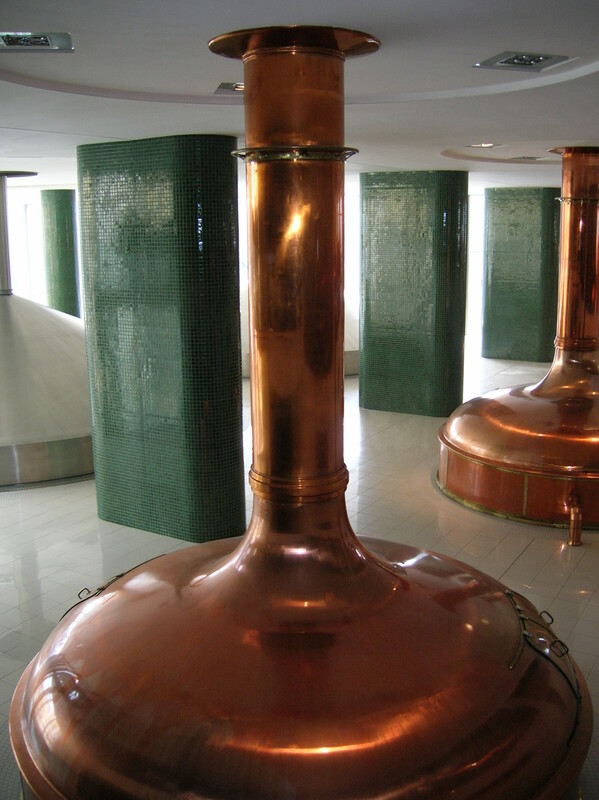 A servant was filling mugs with beer, for example. Rich in tradition, it depicted the bride without the groom, seated at the table with her head crowned in a small wreath. A child tried the creamy porridge, licking the bowl. Everyday people were engrossed in what were for them everyday activities, some profession-related, others focusing on leisure. The portrayal of the common man as a miner minting coins was, in my mind, connected to the Flemish and Dutch canvases celebrating everyday life. A statue of a miner appeared in the cathedral as well, which made the relationship with Dutch and Flemish works of art even more apparent. In another Chapel the Smíšek family huddled around an altar. Saint Christopher carried a child on his shoulders in one large fresco. 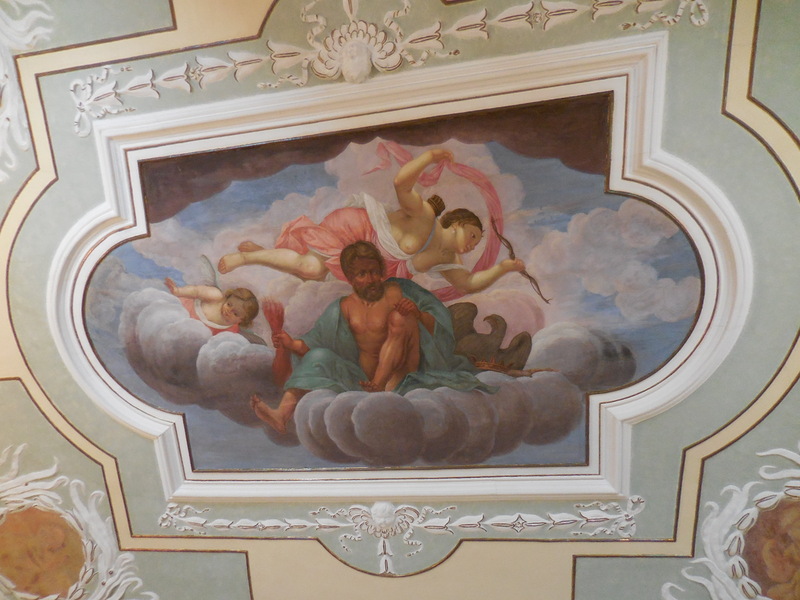 Then I meandered to the other side of the cathedral, where I saw a mural with a different theme: Created in 1746, “The Vision of Saint Ignatius Wounded in the Battle of Pamplona” showed off angels fluttering through pink clouds. I was also entranced by the stone pulpit, built in 1560. 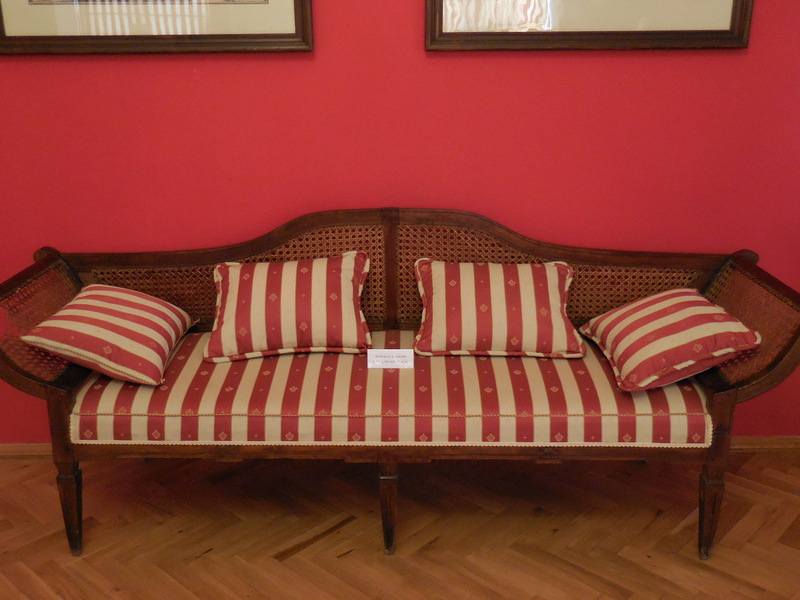 The 17th century ornate wooden pews caught my eye, too. After exploring the interior of the cathedral, I was hungry. I stopped for chicken on a skewer at a restaurant with outdoor seating in a courtyard on Ruthardka, a romantic and picturesque street cutting through the center of town. 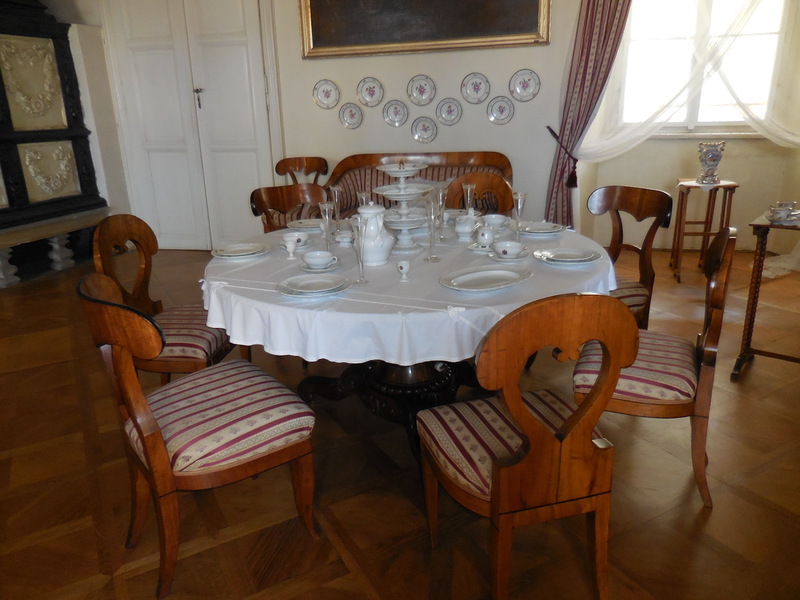 After lunch I stopped by Hrádek or The Small Castle and was eager to see the museum about the town as well as the history of mining and silver in Kutná Hora’s past. The entranceway was full of teenage tourists enthusiastically chatting to each other. I did not want to visit the mines again – I was too claustrophobic – so I asked for the short tour. The man at the box office said he did not think there would be a short tour that day, but maybe he would have one around four p.m., when I had to be back in Prague. I was disappointed as I had read that the former royal residence was decorated with a Renaissance coffered ceiling from 1493 and consisted of halls featuring late Gothic ribbed vaulting. The medieval Saint Václav Chapel boasted wall paintings of Czech saints, I had read. This museum would have to wait until another time. 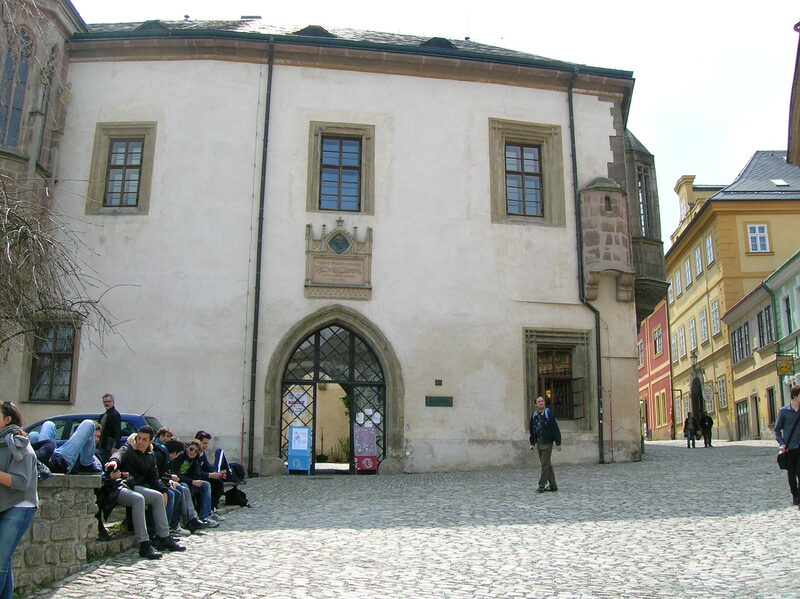 I carried on to the Stone House, which harkened back to the era before the Hussite period of the 15th century, though it was last reconstructed at the turn of the 20th century. I was fascinated by its richly decorated Gothic façade, even though it dealt with the grim theme of death. I spotted Adam and Eve under a tree in the gable. First, steep stairs led me down into the lapidary in the basement, which was part of the pre-Hussite structure. The collection boasted stone fragments from medieval times. I was especially enthralled by the pieces of the outer buttresses of the Cathedral of Saint Barbara, especially with the stone set in a fleur-de-lis pattern. I also saw pinnacles, finials and crockets. 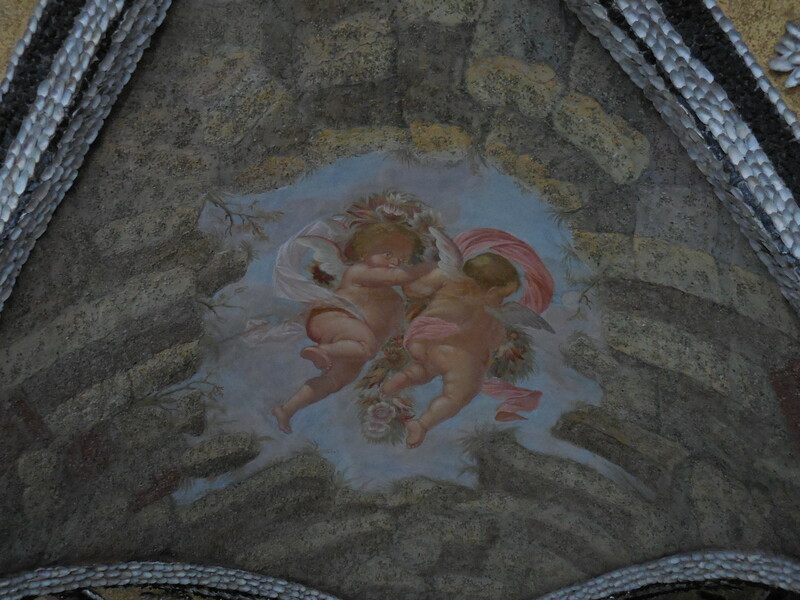 The angels that had originally decorated the cathedral entranced me, too. 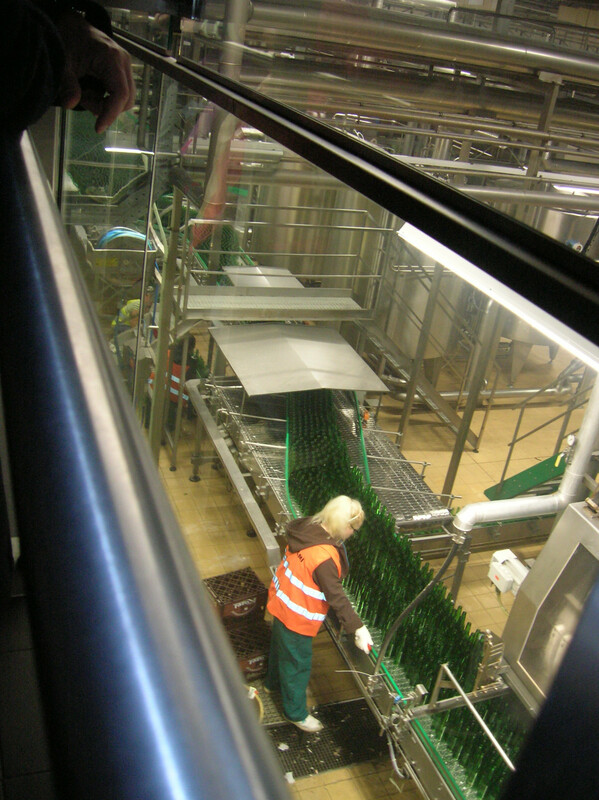 Then one of the guides, a cheerful woman in her forties, gave me a tour of the first and second floors. 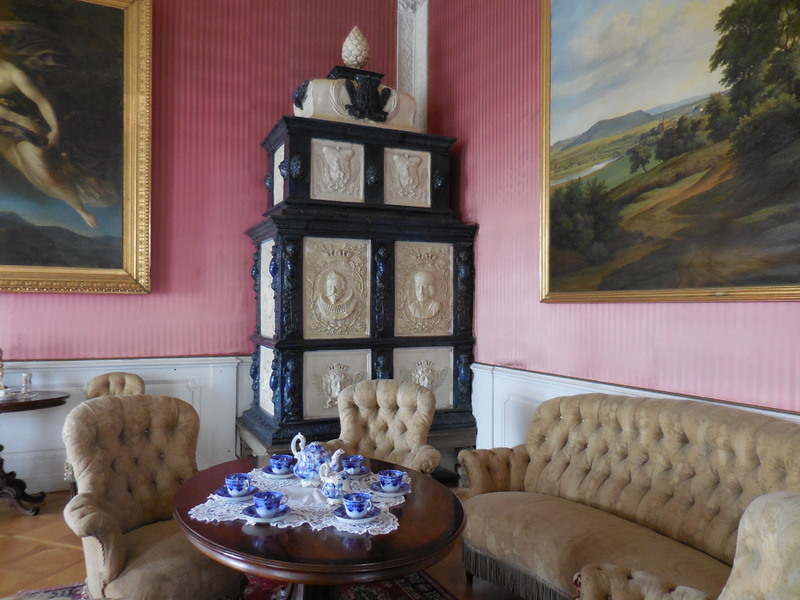 Part of the first floor was devoted to objects representing the city’s former guilds throughout the centuries. This I what I liked about small museums. They often contained pleasant surprises. I had never seen an exhibition dealing with guilds. One artifact looked like a griffin sticking his tongue out. Two lions and a crown represented another guild. The symbols of the guilds were intriguing. In the hallway stood a painted wardrobe and chest with folk themes. I loved folk art, so rich in tradition. 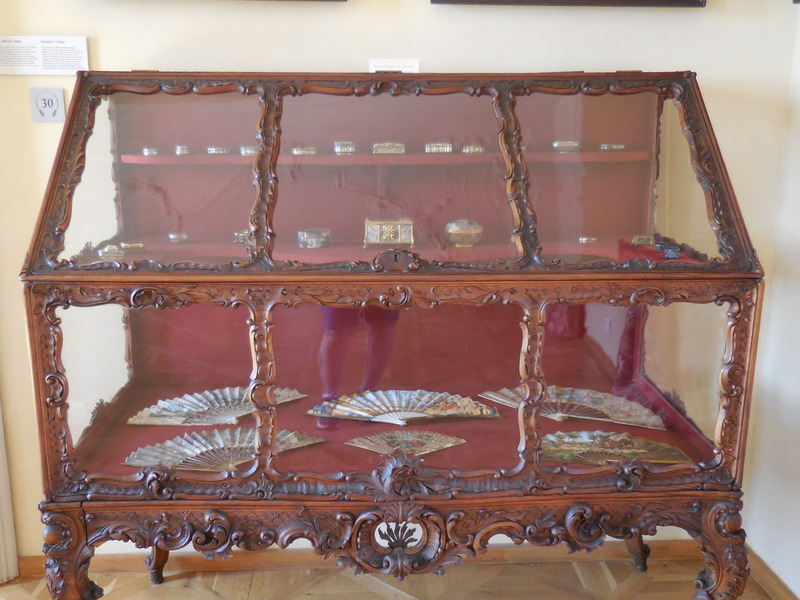 Another space featured Baroque and Biedermeier furniture as well as a forte piano from the 19th century. 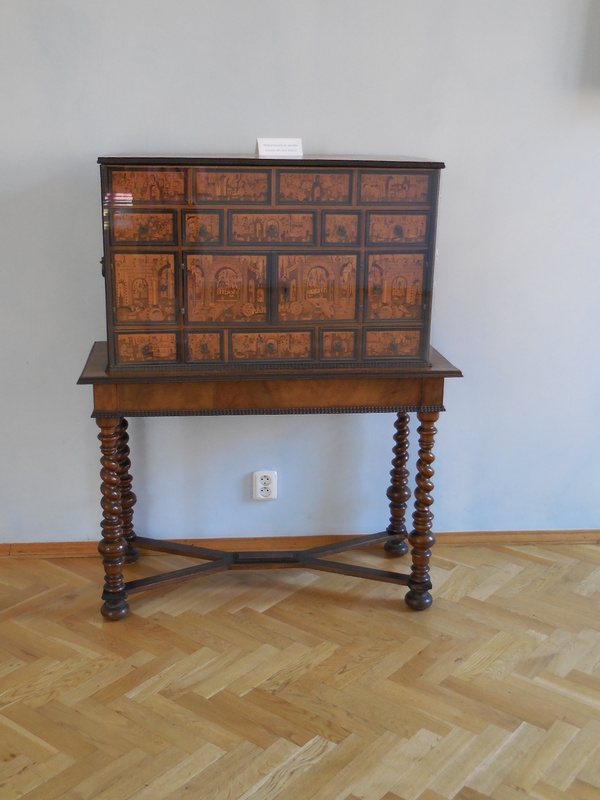 The Baroque desk and wardrobe from the 18th century caught my attention. On the second floor relics from religious orders greeted me. A New Testament hailed from 1677. I also saw a silver reliquary and pewter altar vase. Especially intriguing was the small, woodcut relief of Madonna and Child from the 19th century. A Pieta scene from the 18th century captivated me as well. My favorite, though, was a sculpture of Saint Mary surrounded by miners. She wore a star-studded golden halo, her hands clasped in prayer. Bruegel the Elder also dealt with everyday people’s relationship to religion. I thought of the canvas featuring Carnival and Lent again. I did not have time to go to the Italian Court that day, but I would come back again soon to visit it. 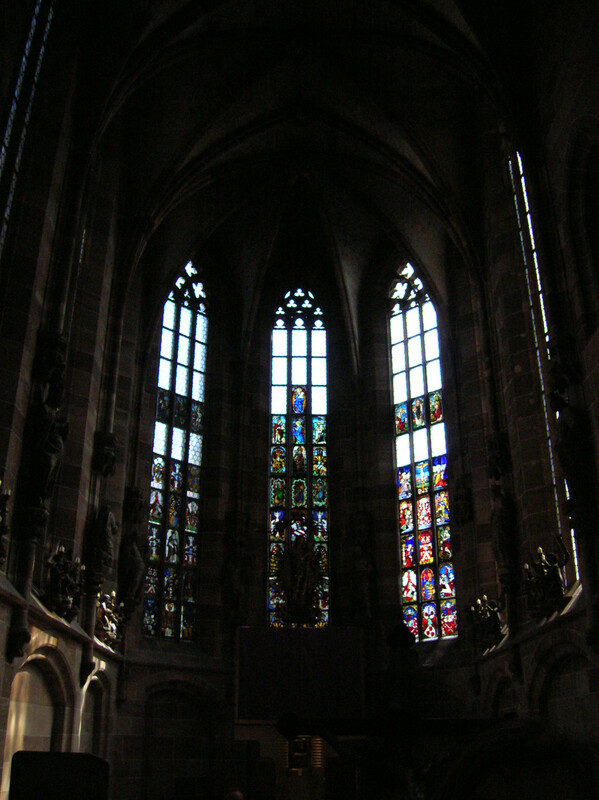 I recalled its royal chapel in Gothic style with Art Nouveau decoration. 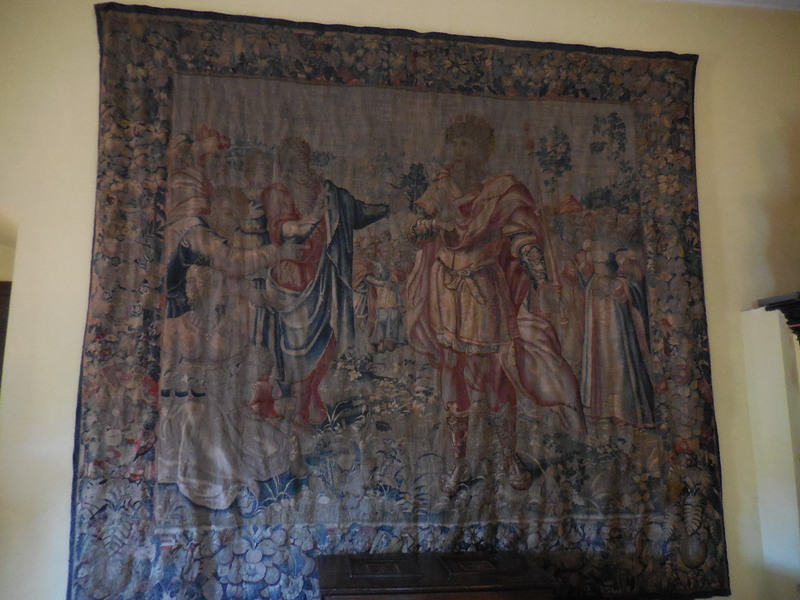 The Italian Court, hailing from the end of the 13th century, had played a significant role in the town’s history. The Prague Groschen was first minted there. Kings of Bohemia had stayed at the Italian Court, and Vladislav of Jagollen had been voted King of Bohemia there during 1471. 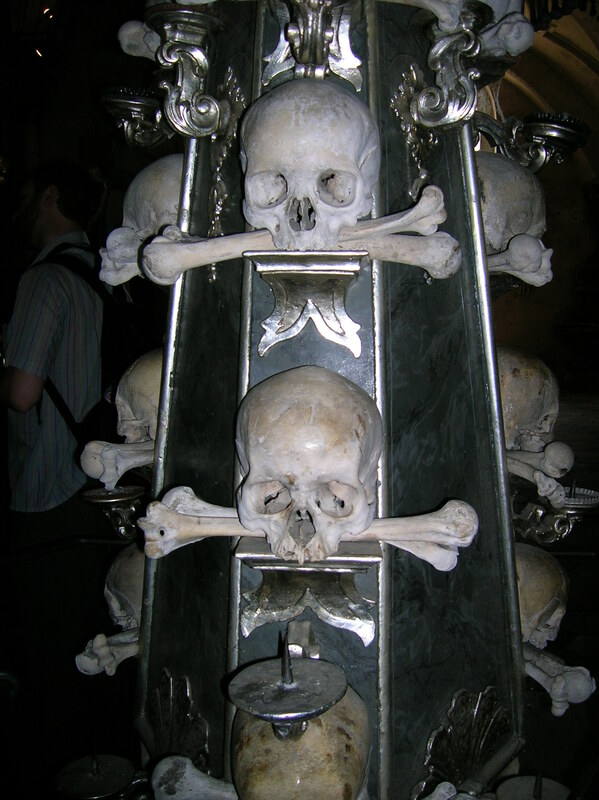 I knew that the 12-sided stone fountain was under reconstruction, so I headed for the suburb of Sedlec , where there was an ossuary and cathedral. A 20-minute walk took me to the ossuary with a cemetery, hailing from the 13th century, the resting place of many plague victims and fallen soldiers from the Hussite wars. The ossuary in the All Saints’ Chapel went back to the 14th century. I remembered the space being bizarre and morbid yet fascinating at the same time. 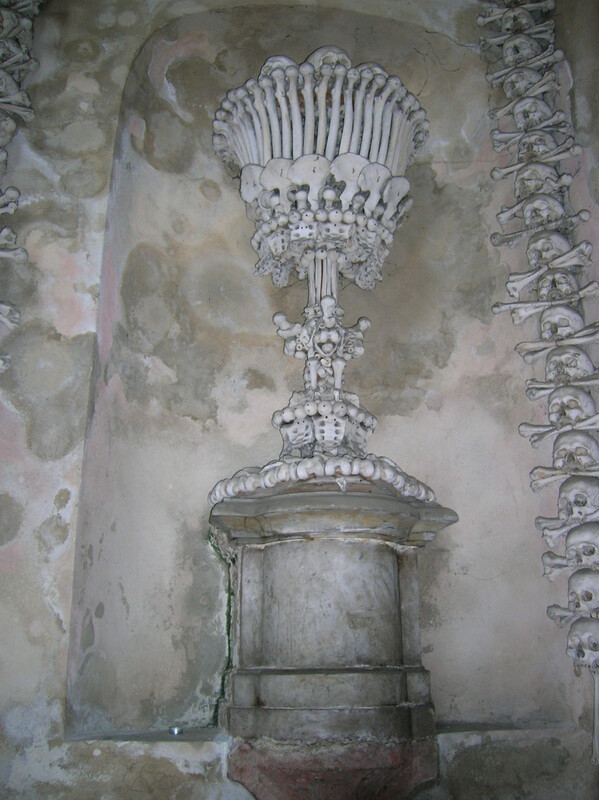 The Schwarzenberg clan had purchased the ossuary in 1784. They arranged the 40,000 bones and skulls into various shapes. 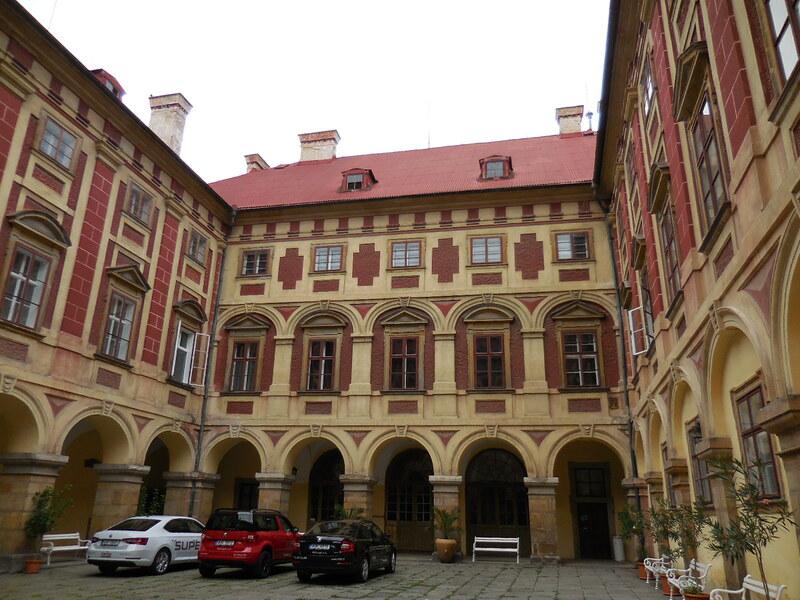 Before that, architect Jan Santini Blažej-Aichel had renovated the space in his unique Baroque Gothic style, which I deeply admired. 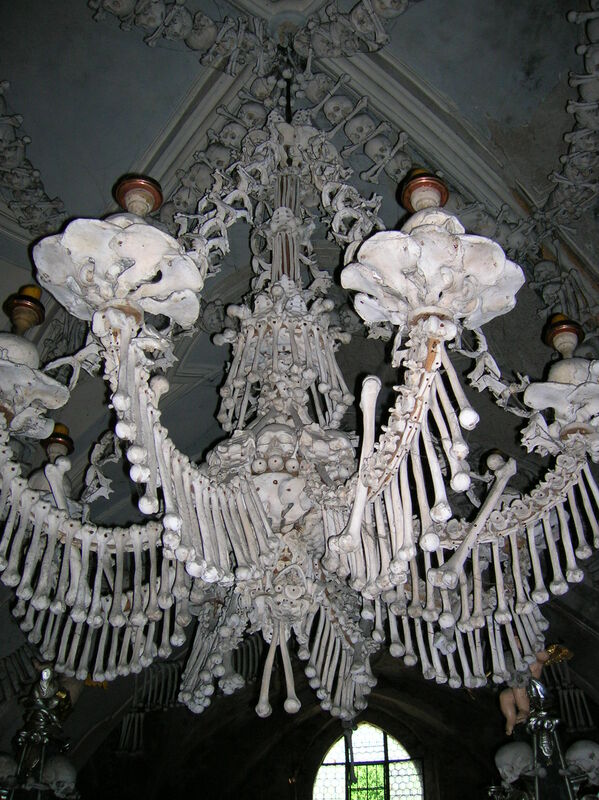 I gazed at the bones forming a huge chandelier, a Gothic tower and a chalice. 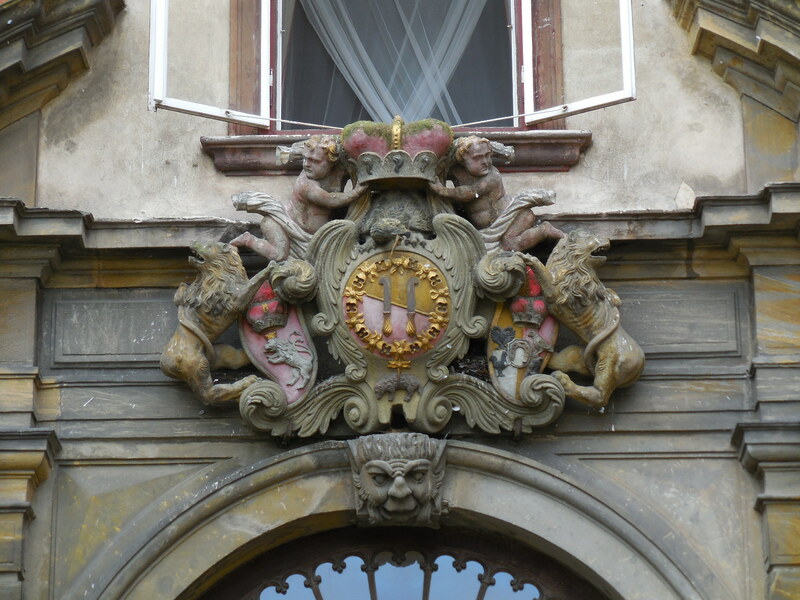 I was enamored with the Schwarzenberg coat-of-arms. Bones depicted a severed Turk’s head and a raven. The chandelier was my favorite, though. I also gazed in wonder at the skulls from soldiers during the Hussite wars of the 1420s in one display case. I could hardly believe that I was looking at skulls that were so many centuries old, skulls that had once been heads of living human beings. Last but not least I visited the oldest cathedral in the country. The Cathedral of the Assumption of the Virgin Mary and Saint John the Baptist has been a UNESCO site since 1995. 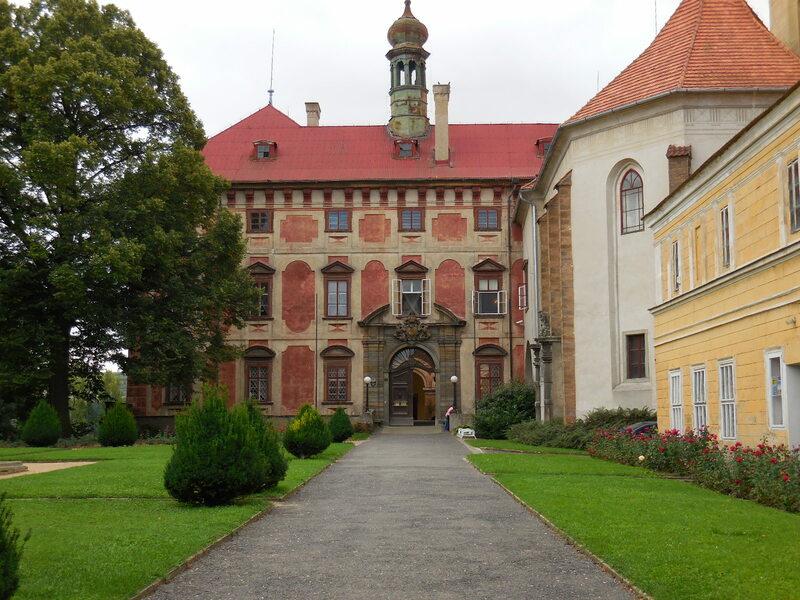 It was constructed from 1282 to 1320 and got a makeover in Baroque Gothic style by the brilliant Santini Blažej-Aichel. I was astounded by the seven chapels and the renderings of saints. I was very excited to see three paintings by my favorite Czech Baroque painter, Petr Brandl, whose works evoked such strong emotions in me. I admired the Baroque confession booths, hailing from 1730. Saint Vincent’s and Saint Felix’s relics, donated by Pope Benedict XIV in 1742 on the 600th anniversary of the monastery, were also fascinating. 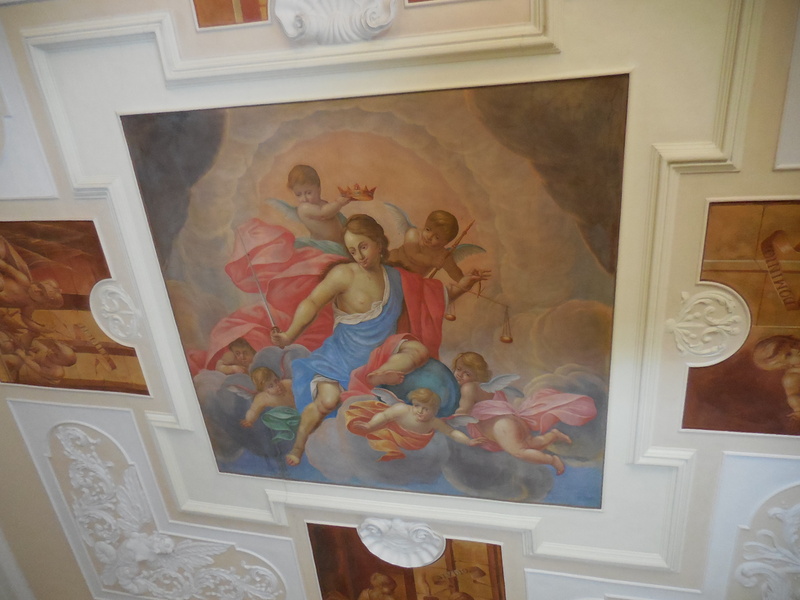 The Chapel of the Virgin Mary of Sedlec was impressive with its elaborate Ionic columns and plump putti with angels. The statues originally on the west front of the building intrigued me, too. My favorite was a haloed Saint Benedict gripping an open book. I thought of how literature had opened up new worlds for me, especially the Slovak writings of Václav Pankovčín and his penchant for magic realism. 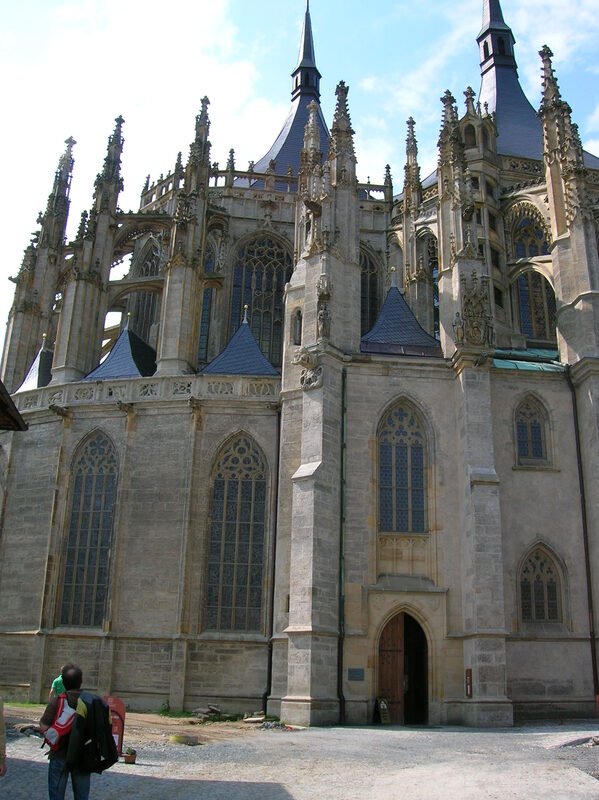 Once again, Kutná Hora had cast a magical spell on me. I had strolled down medieval streets, toured two cathedrals, visited an ossuary and a museum- all delightful and inspiring experiences. Now it was time to catch the bus back to Prague. One thing was for certain: I would definitely be coming back here. Soon.